Like I mentioned in my post the other week, the last time I did a big cooking day, I had a big ah-ha moment. Although, I had a blast with Lauren, it was logistically very difficult to accomplish. Between the juggling of cooking and childcare, the prep work, organization and scheduling, it can be overwhelming. So on this big cooking day, I did it by myself and only did slow cooker recipes. Basically, all I was did was chop vegetables and assemble ingredients. Even with doing it this way, it was still a 3 hour affair, but during this time I was able to finish all the cooking AND the cleaning. Most importantly my feet didn’t ache at the end like they normally do. I also didn’t have any sort of panic or anxiety leading up to the big cooking day like I normally do. HUGE. I chopped all the vegetables with Penelope in her Learning Tower before nap, which was really fun. I went through all the colors of the vegetables with her and talked about rainbows and made it a fun learning experience). Then I assembled everything during her nap (thank you Jesus, I can now skip a pump session here and there and can do other things at nap time than sit in front of a computer) and finished cleaning up after nap, again with her in her Learning Tower. This time she played independently with a bowl of soapy water, she made a huge mess, but the rags I used to clean up her mess where the same rags I used to clean up my mess so it wasn’t that bad. I just dumped the veggies into the gallon sized ziploc bags, then added the meat, then added the spices. Once I was done and cleaned everything up, I felt like I had invented electricity! I thought I was such a genius for finally (it took me over a year, people) getting once a month cooking down to an efficient and easy art form. I am telling you it will change your life! Give it a try and tell me how it went! Here are my recipes. I use a ton of vegetables in each meal because I don’t tend to eat a lot of veggies throughout the day, so I try and get them all in at dinner. And Peter is more apt to eat veggies if they taste like barbecue or curry than as a plain side dish. Every slow cooker is different, so just watch yours the first time you make it. This seems so doable, and that is so exciting!!! I have wanted to try once a month cooking, but it is a daunting task! Question — does each of these recipes make enough for two meals for you? Could you give us a guesstimate on serving size? Thanks for sharing!!! I know, it is exciting!!! Each recipe made me two gallon bags full of food. Each bag gave me two dinners (for two adults and one toddler) and two to three lunches (just for me). I did a large amount of prepping this past weekend and as a result have 8 bags of food in my freezer. I made the Terriyaki Chicken last night and was pretty disappointed. It all turned brown and so did not look appetizing at all. I think if I were to do it again, I would cut down on the Terriyaki sauce, and put the carrots in the last two hours and the pineapple in the last few minutes. I think because my family does not like mushy veges, when I do this again, I will not put the veges in the freezer bag. I am anxious to try the others though! And thanks for sharing! You could still prep it all and just put the veggies in a second bag and tape it to the one with meat or use a separate bag for the veggies inside the meat bag. That way you still don’t have that much work to do the day you use the meal. I also believe that it really has a lot to do with the crock pot too. Mine is just really hot and cooks fast so I have to cut the time down on it. I agree with Genette! I have a HUGE crock pot that cooks like a crock pot on steroids, lol. I always cut the cooking time of any recipe, especially ones that don’t fill up my entire crock pot (most recipes don’t), by AT LEAST a 3rd…sometimes half. When I first recieved my crock pot as a gift I was working full time and I can’t tell you how many times I came home to over cooked meals or mushy veggies. I’ve learned to either double the recipe so that the crock pot is full, cut the cooking time, or turn the crock pot down (mine could still roast a turkey on the “keep warm” function, lol) to acheive the perfect meal. Yeah, every slow cooker is different and you really have to know what works for your cooker just like ovens are different and you gotta watch and pay attention and see how long a recipe really needs to cook in your oven. I also had this problem bcz my crockpot cooks very fast so I bought a little timer that plugs into the outlet and the crockpot plugs into the timer, and I set the timer to start the crockpot at about 12 since I’ll be home around 5:30 and something that says to cook on low for 8 hrs, cooks in about 5 1/2 so this idea works perfect for me. Having a warm setting is a good thing to have on a slow cooker too, so if you get home after its done it doesn’t keep cooking and burn it,it just keeps it warm. I love my large crock pot, but with two sons gone to college it has been an adjustment! So I bought a smaller one for the downsized family, with much better results. Also, if a month at a time seems crazy, try doing meals a week at a time. One evening or afternoon of prep, and the whole week is easier, and more time efficient! I had the same experience as Pat. Maybe I just overcooked it, but I don’t think I’ll try this one again. Thanks for sharing so many recipes at the same place. I love Chicken Curry. I am gonna make it tonight. I am allergicc to curry, is there another seasoning I can use which would give a similar flavor? Also I am not a fan of sweet potatoes, could other root veggies be used in the place of sweet potatoes, maybe kohlrabi, turnips, or russet potatoes? I am not sure about a subsitute for curry, it’s a pretty unique flavor but I will look into it. Turnips would be great. Or more beets if you liek beets. Russet potatoes will work, but they don’t hold up as well as sweet potatoes. I know this conversation is a year old but I am just seeing it. Curry is a combination of many spices. If you found out exactly which ones you are allergic to you might be able to make your own mix but omitting those ones. It won’t be the same, but about as close as you can get. Ok, I'm drooling! These look awesome! Thanks for sharing. I have a question – do you cut up the chicken raw? I'm not a fan of touching raw chicken, but I guess if I make this all at once it wouldn't be so bad…. I find that if I freeze the meat about 15 minutes…cutting the raw meat is less of a sensory issue for me. 🙂 Quicker, easier, less messy. That is a great tip, thanks! I can’t stand touching raw meat so I bought a box of sterile latex gloves and keep them in the kitchen. I do the same thing, Becki. And I always buy boneless breast. I cannot do bones. If I had to do bones, I would totally be a vegetarian. I’ve been using disposable gloves for years. Great for not having to touch raw meat. Great for cleaning out a turkey. Plus, if you have small kids you can tear them off quicker than washing your hands when you have to go find out “what the fuss is all about”. The gloves are also handy if you are chopping any kind of hot pepper, for keeping the oils off your fingers and out of your eyes. I use gloves for peppers and onions. Sometimes I even using swim goggles when doing peppers. This may sound crazy, but my eyes are really sensitive to jalapenos. It works great! They are awesome! Really good recipes. I know, I can't stand cutting up meat too. I am getting used to it though, it seems to get easier every time. I just HAD to comment — I discovered your blog yesterday via PrudentBaby and I am SO very thrilled that I did. I'm loving your take on motherhood and am a very excited new follower! I am SO excited to be doing this tonight! What a great idea, especially when I rarely have a spare hand. Let us know how it went, Erin! Yes, kitchen shears work best…especially if the chicken is a bit frozen…. I use kitchen shears to cut pizza, it works well when my pizza cutter is dirty and I dont want to fish it out of the sink. I thought I was the only one! Everyone I talk to seems to think I’m weird! I’m sure it’s only because they haven’t TRIED it. It’s SO much easier than a knife! Oh my goodness! This is fabulous!! Thank you so much for sharing this! These will make those crazy first weeks back to school (I'm a teacher so it's REALLY crazy around here!) less hectic. Ahhh…dinner will be served! How long can you keep these in the freezer before you cook them? @KneKno…I will have to try that out, thank you! @Shelly…so glad to hear that Shelley! @Vanessa…I would think about 6 months. I usually use mine up before then, but that sounds about right! Wow, this is amazing! I have four kids, so I think a two gallon bag would make enough for one dinner for the 6 of us, and this sounds so perfect for recovering from vacation, surgery, baby-birthing, the first week of school, etc. Just genius, thank you so much. Here is a thought. You can buy crockpot cooking bags. If you freeze meal in that, let thaw in crockpot while on low, then stretch out bag in crockpot. Cook desired time. Remove meal. Throw out bag and…..no clean up!!! LOVE IT. I have used these bags and they are GREAT. I thought about this too but another blog mentioned that something in the freezing process caused the crock pot bags to lose integrity and lots of ladies said that the bags leaked badly when they tried this. Hmm, I have never once had a bag leak on me. You just saved my life. I've been hoarding food in my freezer because I have a husband and 3 kids, and I'm starting nursing school in less than a month. I've been cooking everything, but this idea is so much easier and will save me a ton of time! Thank you thank you thank you!! I also am in my first semester of nursing school! I have been trying to think of meals to make and freeze to save my time and still have home cooked meals for my family! Thank you for sharing! I wish I had found this website prior to now. I have been in nursing school for the past two years and it has been hectic and stressful to be a full time mom and wife and also a full time student. Whew! Thank God I will be graduating in two weeks! But, I will still try this. Can’t have enough spare time, right? Welcome!! Can never have enough time! I am starting an accelerated nursing program in May (16 months for a BSN, eek!!!) I am so happy I stumbled across the idea of crock pot freezer cooking. Thank you so much for helping to make other’s lives easier! How exciting for you!! This way of cooking will be a HUGE help, promise! How did the noodle one turn out? I can't imagine hot cooked noodles…frozen…then in a crockpot for 4 hours. I would think they would turn to mush!? She explained at the bottom that you would cook the noodles and add the sour cream the day that you cook the meal in the crockpot. OK this is the best idea yet!!!! Thanks for the ideas and if you have more recipes please share them!!! This seems awesome! So trying this and your recipes. This has gone semi viral on pinterest! for the bbq chicken recipe did you use orange sweet potatoes or white skin? looks like you used yams instead of sweet potatoes in the photos? Oh this is so rad…I landed here via Pinterest. Thank you – I'll be trying this! Great idea. I'm new to freezing and have one question, do you cook the meat prior to placing it in the freezer bag? Thanks! no you do not cook the meat prior to placing in bags. the crockpot cooks the meat. This is great! I love my slow cooker, what a fabulous way to make your meals ahead. I will have to give this one a try. Question: Do you add liquids to the slow cooker when you cook it? @Sunshine, I always just eyeball portions so that sounds right, remember everything cooks down to less quantity in the slow cooker. @ldsgoff, I never even heard of slow cooker bags, I will have to check that out. But wouldn't the chemicals from the plastic get into the food, when heated? Or am I missing something. I am tired! @Kelly, so happy I could help! Good luck with nursing school. @Tina..I cook the noodles separately, the day I have the meal in the slow cooker. @penny renee…yes, more recipes coming soon! @The Informal Matriarch…I know it is crazy! I need to get on Pinterest ASAP and check it out! @toni…I use sweet potatoes…still a starch, but more nutrients and vitamins than a white potato. Welcome Amanda, so glad you are here! Hope you stick around! @Britni, yes that is exactly what I do. I make my own stock, and freeze it in 3 cups or 1 cup and then I throw it in frozen and it melts in the slow cooker. Thanks again for all the comment love, I really appreciate it and so glad ya'll found this helpful. More recipes coming soon! I have always shied away from meals that you had to "cook", freeze and then cook again. It always seemed like more work. But I love my slow cooker! And I love this idea!! Thanks for a great idea!! Saw this on Pinterest! Look forward to giving it a go. Will let you know. Follow up question to the stock… Do you add stock to the recipes and how much? You probably said somewhere and I just missed it! Thanks!! I love this idea! I love cooking with my slow cooker and this would help make cooking so much easier for me. One question: I want to try this with other recipes as well. If I wanted to make something that called for ground beef, would I fry it up and then freeze it or freeze it raw with everything else and let it cook in the slow cooker? @Sunni…so happy to hear! Let me know how it goes for you. @Laura…the liquid amounts should be in each recipe, but I will check right now. @Jenn..welcome! please check out my archives, lots of good stuff here! And yes, more recipes coming soon! @mommy2luke…I would put it in the bag raw. So far, none of my recipes need to be browned first. This is probably a dumb question, but it does not seem that you have any liquid in your recipes. Does the food dry roast in the slow cooker, or do you have to add some water? I do have a slow cooker that has never been used, so this would be a wonderful opportunity to try it out. the goulash recipe calls for 1/2 sour cream. is that 1/2 cup or half a small container? What a great idea! I'm expecting baby #3 and this will be perfect for right after he/she gets here. I found you on pinterest. Oh, I am SO doing this to get ready for when the kids and husband go back to school and things get crazy! Love this idea! @Yvonne…you are right. 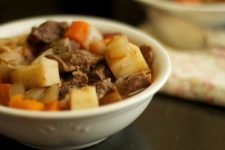 The recipes in this post have no liquid, but if you search my archives for my other slow cooker recipes, some of those call for stock. @impchild…yes you are right, its a 1/2 cup. Thanks for the catch! @Danielle, congrats on baby #3! Let us know how it goes for you. And so glad you found me! @Mama Bub…so glad you like the idea! I just found this via Pinterest and not only love the idea bu also your blog – breastfeeding, yoga … my kind of place! Q: I have never frozen vegies like this because I have always heard you need to blanch them first. Have you ever heard that or is it an Australian old wives tale? This is so simple and wold really work for us! Could you use the slow roast bags to freezer the ingredients in then put the bag in the cooker? I am a daycare provider and these recipes sounds amazing. I will defiently be trying these for quick and healthy lunches! Oh this is great!!! I have been looking for meals that will be easy for me to prepare/make since I started back to school. This sounds like it will help SOOOO much! Thank you for sharing! THANK YOU!!! This is pure brilliance! I'm about to enter the activity phase of life with 4 small ones. 3 in school and all 4 in after school activities and I was wondering how in the world I was ever going to get dinner ready. Now I can do the work when I have time and throw it in the crockpot in the morning and go, go, go. Seriously, thank you for sharing your brilliant idea. Saw this on Pinterest and I love it! The blog is fantastic. Looking forward to investigating the site more. I found you through Simply Frugal and I can't wait to try the recipes out. I think I'll invite a few friends over and make a party out of it. @Yvette…I never blanch them and they turn out fine. @Candace…congrats Candace! So glad it will help! @Anonymous…someone else mentioned that, but I am not sure, I have never done it. I will have to look into them. @Pokeyann..Thank you!!! So glad it will be helpful. @lionsmiles, so glad you are here! @Gem…I have never heard of Simply Frugal, will have to check them out soon! What a great idea! 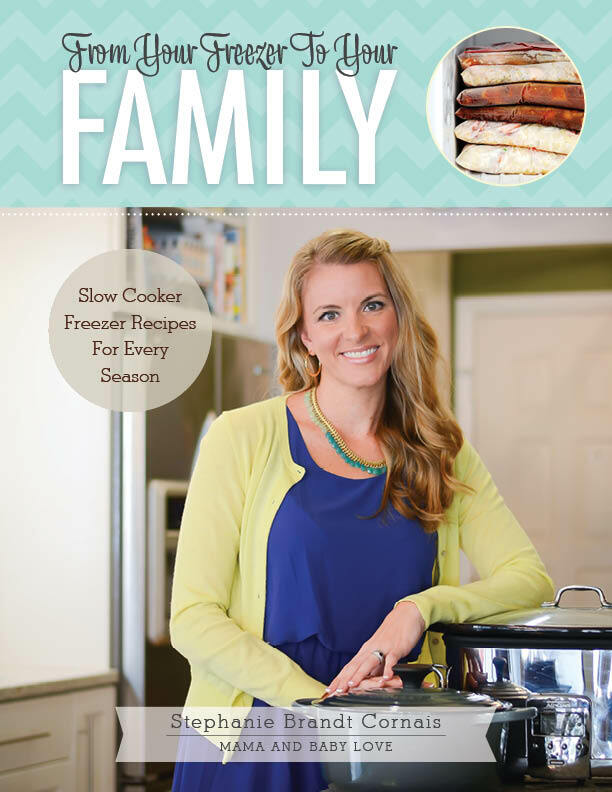 I'm a working mom, and the slow cooker is one of my best friends! I made these this weekend, and it was super easy. I nursed my son and let my husband do nightime, went to the store about 7,and by about 9:15 I had gotten all my groceries, and done a lot of my pre-chopping. Then today (saturday) while my son was taking his morning nap I put everything together and cleaned. Unbelievable to get it all together so quickly! Also, for everything except the chicken and spices, everything was about $60 (since it is summer, a lot of the veggies were on sale). So $60 for 6 meals is GREAT! I can't wait to see how it all comes out. I have a quick question, though- are all the recipes doubled (and then you split it into the two ziplock bags?) For example, if it called for 1 zucchini, then that's 1/2 for each bag? I just wanted to double-check, especially with the spices, etc. ALso, you don't add any water or anything when you cook these? I know the veggies will release a lot of water, and just wanted to be sure. So happy to hear that Kara!! Honestly, I mostly eye ball the vegetables and try to put as much as I can fit in the bag. And yes, I didn't put any water extra in these recipes. Thanks so much for sharing! how much chicken bouillon in the chicken curry? do you add it before freezing or before cooking? thanks! @brianandbethany…just one per bag. I added it to the bag before I froze it, because I just want to be able to dump the bag out into the slow cooker and turn it on and not use my brain at all! I love this idea! As soon as the weather cools off, I'm trying it. Can't wait to see how it works out. thanks for your response! just one more question – are you referring to the bouillon cube with the cup of water to give with it or a can of chicken bouillon? thanks again! How much stock do you add for each meal? Also, for the BBQ, do you cut up the chicken or leave it as drumsticks? I couldn't tell from your picture! LOVE the idea of no-cook freezer cooking, especially when you can just dump it all in the slow cooker!! please, please try to find more recipes! p.s. found you from simply frugal also! I made all three of these recipes last night and stuck them in the freeer. So excited to try them and to know that I have 6 meals just ready to go! The chicken curry recipe looks fabulous!! Can't wait to try them all. The chicken curry recipe looks GREAT! Can't wait to try them all! Great idea! To clarify: meat is raw when frozen with veggies? And HOW MUCH liquid do you add at the time of starting the cooking? A couple of years ago my daughter and I did a couple of Dream Dinners stints and it was so freaking expensive. This looks totally realistic and doable! I'm going to give this one a try once I get the kids back in school. Thanks! PS: this is Heather from Blogstar. @brianandbethany…I just used one cube, no extra liquid. @Sheyenne…I just left the chicken as drumstick and legs. You could do this with breasts if you wanted to, but the chicken would end up shredded at the end. Which could be cool, you could make bbq chicken sandwiches! @Delana B…I am coming up with new ones as we speak!! Coming soon! Yay, Joyful Baker!! Isn't it the best feeling when you are all done? @Mabel, I will have to check it out, thanks! Hi Heather! What is Dream Dinners? I have never heard of that before? You are a genius and my new hero! THANK you, and thank you again! I got your site from pinterest and I am so excited to try it! All my veggies are cut and now I just have to assemble. Quick question, is the sour cream put into the bag as well, or it is just a garnish for the dish once it's done cooking? I'm about to have baby #2 and I am so grateful for this awesome idea that you've put on here! Thank you! I have done this during my third trimester with my last five babies! A wonderful time saver! I've thought of doing DreamDinners.com too, but I have to work around many food allergies with my oldest two daughters, and they can't promise that the meals will be cross-contamination free with so many people using the ingredients. This is a BRILLIANT idea! We buy the freezer meal-in-a-bags sometimes for the convenience, but they are full of so much sodium we can't eat them too often. This will save so much time, thanks for the idea! Holy amazing! Found you via Pinterest…and I'm SO glad I did! This is one of those "Duh, why didn't I think of that already?" moments! My goodness, how genius! Thanks!! This is the best post i have come across today!!! great idea!!! Wow I am a mom who travels a lot for work, this will ensure my family is not eating out every night, and eating healthy. Please post more anytime! Thanks so much and the slow cooker bags are wonderful but don't seal like ziplock but it looks like you could just dump the contents of the freezer bag into the slowcooker bag and then clean up is a breeze! I tried the BBQ chicken one and it was delicious. I cooked half from fresh and I love knowing that the other half is in my freezer waiting to make my day easier sometime soon! Thanks for the recipes. Will it work with most crock pot recipes? I use mine a lot and it seems like we always have lots of leftovers, so I think I'll have to try freezing some of my usual recipes. Hmm.. did you freeze your veggies without cooking them at all? This looks awesome! However, I am a grad student who's busy but doesn't have a family to cook for–it's just me! 🙂 In regard to serving size, what would you recommend? I don't usually like eating something for days on end in a row, so could I split it up into smaller portions before freezing? And what would you recommend re: cooking times in that case? @Chris, yes smaller freezer bag portions would be perfect. If you have a small slow cooker that would be good too, then less to clean up afterward. I am not sure on times, but I bet it would reduce the cooking time, so just try it out and keep your eye on it. Let me know how it goes. 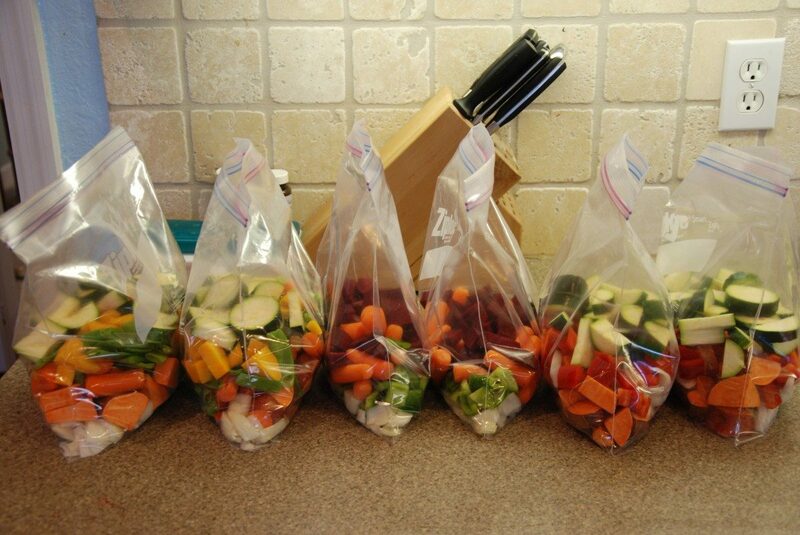 Great idea… but many vegetables need to be blanched before freezing. This stops enzymes from breaking down the food. Freezing alone will not do this. Btw… you seem like an awesome mom. I made all of these meals yesterday and froze them. It was such a great feeling knowing that I wouldn't have to slave away every day this week in the kitchen. Thank you for posting these recipes! I put the Healthy Mama Barbecue in the crock pot this morning before church and came home to a hot, easy dinner. I liked this meal. My husband does not like sweet potatoes but I do, so I cut the amount in half and added some red potatoes. I was glad I did because I did not like the sweet potatoes at all! They were too mushy and too overwhelmingly sweet. Next time I will only use red potatoes. It seemed very runny even though I did not add any liquid. I was not expecting that. I used drumsticks but did not have enough chicken for my family of 5. I might use chicken breast next time. I do not want to give the impression that this was not a good recipe. I enjoyed the flavors a lot! I also enjoyed the time I did NOT spend in the kitchen today. I spent it with my children instead. Yeah! I would probably give the recipe a 3.5 stars out of 5. I think this is good recipe and I will definitely make it again. I have been converted to freezer crock pot cooking! Thank you! @Jillian, someone else mentioned that too, I will have to look into it. @Shanna, thanks for the feedback, yes they all tend to be mushy, type meals, so we always eat them with cous-cous or rice. I like it that way, but I could imagine that some would not like the texture. Eating soft, warm, soup like meals is supposed to be very healing and restorative according to Ayurveda. @Clydia..so glad to hear, let me know how it goes! YEAH!! I have 4 kids ages 6 down to age 1, homeschool, love to craft, sew, blog and did I mention I have 4 kids:) SO this is AWESOME!! Thanks so much Kristy from http://www.apronsandapples.blogspot.com I love your blog. I found it through pintrest and LOVE IT so I am following and just nominated it for a versatile Blog award! Come check it out (currently working on the post for the award! )THANKS AGAIN I will be featuring you and linking back for your great idea! You may have addressed this but I did not read all of your comments. Do you cook the meat prior to freezing? @apronsandapples, wow four kids!! thanks so much for being here. I'm so excited about this! Thank you for sharing it. My girls (10 and 8) and I just finished all the prep and clean up in an hour and 20 minutes. Six meals for a family of 6 in that amount of time is just my style. With school and soccer starting along with two birthdays and an anniversary, we are sure to be using some of these this week. Best idea EVER! I love my crockpot! And I love 'freezer cooking' this is so simple yet so smart! And almost any slowcooker recipe can be used! Awesome Awesome Awesome!! Oh my THANKS SO MUCH!!! I have 2 toddlers and my hubby works TONS, so i am always wanting new & quick dinner ideas! These sound awesome and very doable! Will definately try these soon! Do you have any other ideas for the Curry? My hubby isnt a huge curry fan (and not sure about kiddos). thanks again! Are you going to be making any other GREAT recipe ideas soon? @ ecumeg – Try Garam Masala instead of curry powder. It’s a fantastic blend of Indian spices – very flavorful but without the typical curry flavor. Genius!! Thanks so much for the idea! Ok…so I've been on the road for a while and before I try this, I want to make sure my measurements are right: 1 recipe makes 2 bags which EACH holds 2 meals…so 1 recipe makes 4 meals? And the meat goes in raw? It's just myself and my husband and I'd like to break it down to 1 meal per bag so we can switch it up and not really have to deal with leftovers, kwim? You are so welcome Liz and Valerie! Has anyone tried the curry? And what did you think? My family didn't like it very much. I think it was the cumin and if I was to make it again I would leave out the cumin. I have put chicken on top of potatoes and carrots with curry on it and they love that, that is why I really think it was the cumin. Let me know what others of you thought! @proudmomm We've tried them all now. I'd say the curry was my favorite. My husband's fav was the BBQ chicken. If I may make a suggestion on the goulash…do NOT put the noodles in the freezer bag! Cook them right before you are ready to serve and combine then. The noodles were just mush when we ate this dish. It tasted good though! I'd make all these again. Thanks for sharing these recipes, Stephanie! I just found your site through pinterest, and it looks awesome. Can't wait to read up on it (during nap times). Question about your monthly cooking… do these 3 recipes provide dinners for a whole month? or am I missing some recipes. I'm just not sure how 3 recipes (6 dinners) translates into a month. Thanks! I was wondering the same thing. I would never freeze ANY kind of raw meat mixed with vegetables. A good work around would be to put the raw meat in a separate bag inside the vegetable bag to prevent cross contamination. It is totally fine to freeze them together, but you are right if it doesn’t sit well with you, you can just double bag and problem solved! The recipe Stephanie's Goulash calls for 1/2 dairy sour cream. I would like to clarify that it is 1/2 cup of dairy sour cream? So you know, just in case the other 100 or so posts didn't cover it, this is freaking genius. I am slow cooker blown away right now. I have this pinned on Pinterest, I linked back to you about it on my blog. How have I never thought of this before?! @christy…yes, the noodles are to cook the day of separately. sorry! @NewWifey08…this is actually about 2 or 3 weeks worth of food, if you were to eat it every day. But we eat out once a week at least, and have pizza once a week, so it lasts us about a month. @Ivie Claudio…yes, as long as you put it immediately in the freezer. I am not health and safety expert, but it works fine for me. Oh, Jane, I am sucker for compliments, I will take all 100 of them! Thank you! Found you through Pinterest! Made the BBQ chicken last night – delicious! Not too sweet & tons of saucy goodness to dip our biscuits in. Substituted yellow peppers for green, but other than that followed it to a 'T' (might add more chicken next time). Cooked half same day and froze the rest… What a great idea! Thanks! Love this! I have done that exhausting bulk cooking so many times, and it's great, but oh the foot pain! I love the idea of crock potting it all, and will definitely be trying this soon. thanks! For the BBQ chicken, do you divide up the sauces as well or put a whole 8 oz can in each bag? Also, do you use 2 gallon bags or 2 one gallon bags? Thanks so much for sharing with us! I have 21 month old triplets this is going to help me so much!!! My hubby is in the Navy so e is gone quite often which leaves me as a single mama! Thanks for takingthe time to do this!! AWESOME!!! Great idea! My question is, I would have to leave it cooking for 10 hours on my work days, how would it be cooking on low for 2 extra hours? Also I have 2, 4, 6 quart cooker, which one would you recommend for the portions you list? @Lani…that is awesome. Thanks for sharing! @Anonymous…Thanks for the love! Right back at ya! @Shay…yes, my aching feet were the main inspiration! @Smilin girl, I split the sauce up between the two bags. And I use 2, one gallon bags. But if you had a big family and big slow cooker, you could probably get away with putting it all in a bigger bag. @larsonck23…OMG, you are my hero. Hope this helps you out tons. @Activity Mom..thanks so much, glad you found me! I made the healthy bbq chicken last night. The flavor was a bit bland and the dish was pretty soupy. I think next time I'll spice it up with some jalapenos. Do you think adding flour to it will thicken it up and not make it taste weird? Otherwise, I guess I'll just make rice or biscuits to go with it. 🙂 Tonight, we'll be trying out the goulash. I'm a little afraid though becuz I didn't realize I had to add sour cream later and not to the frozen ingredients. Doh! @Zay, I am not sure. Maybe some cornstarch? I like it soupy and always serve it cous-cous or rice, or make a sloppy joe type sandwich out of it. finally enjoyed the chicken curry – it's been our favorite of the frozen meals! next time I'll add a little extra water to make some more of the yummy sauce. we also added some sriracha sauce to the finish product to add a little flavor. Hi Stephanie! I wanted to tell you how much I have enjoyed your make ahead crockpot freezer recipes. I used them this month as I have just gone back to school full time, and it has been a life saver for myself and my husband. I am wondering if you have experimented with any more? I have been doing a lot of research and not finding much. I have found a lot of, cook, freeze, then reheat meals…but not a lot of prep raw, freeze, and crockpot meals. I am thinking I will experiment. How did you go about coming up with those recipes? I am certain I can't just open up a crockpot recipe book and expect to be able to do it this way. Thanks! I am going to ask the stupidest question ever, but I am nut about raw meat. Do you put the raw meat in with the veggies when freezing? Glad to hear, Bethany! What is sriacha sauce?? @Emily, thanks so much for telling me! So glad to have been able to help you out. I am sure you could. I get a lot of my inspiration for my recipes from versions I see in a crock pot book. I look for ones that don't require several steps like browning meat or adding lots of ingredients at different times. But the more I do this, the more realize, EVERYTHING is freezable. So I just started picking out my favorite regular meals, and turned them into slow cooker meals and froze them! @EmmaAva…it is not stupid! Several people have asked the same thing, I think it is fine, since it is going straight to the freezer and from the freezer straight to the crock pot…but do you know something I don't?? I am certainly not an expert. I did this two weeks ago, and I felt like I, too, had invented electricity, although the recipes and ideas were all yours. Thank you thank you thank you!!! The meals the past two weeks have been completely hassle free, and they taste GOOD!! Thank you. I made a bunch this afternoon and couldn't be happier! I was directed to your site by another and well…I am glad. Thanks. Hi Stephanie! I wanted to follow up with you about my comment above. I did just go ahead and pick some simple crockpot recipes, prepped and bagged the ingredients over the weekend, and made my first recipe today. It turned out really well. Thought you might want some new ones to try. Thanks again for your inspiration! Sorry but I tried the Chicken Curry recipe and it wasn't very good. The baby carrots didn't cook the zucchini was mushy the spices didn't mix in with everything could just be me and my cooking skill though. 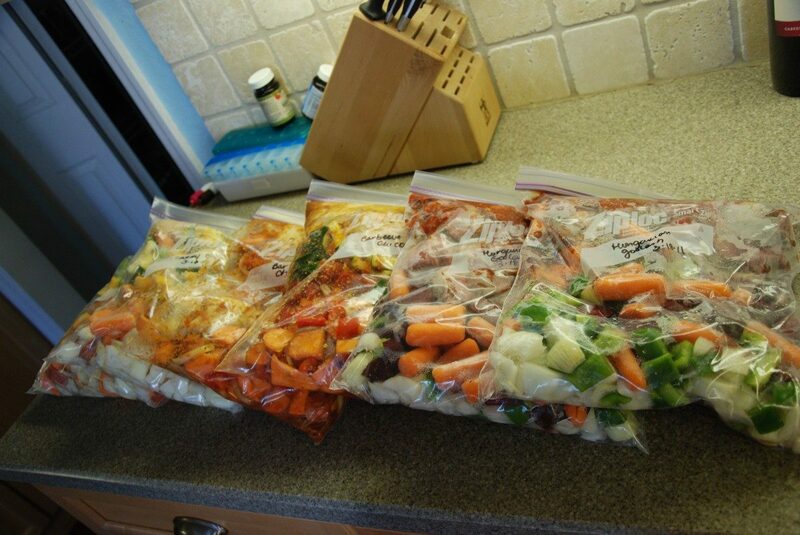 I just love this idea of freezing stock pot meals in gallon bags. Such a fantastic way to squeeze lots of fresh veggies, healthy whole grains, and quality lean protein into one meal – especially for picky eaters (kids & hubbies). So easy for working mamas too – just put it in the crock pot in the morning & when you come back from work – dinner is ready. A frozen packaged grocery store dish like these would probably be fat & sodium laden with less than half of the nutrients (BAD!) so kudos to you for making your healthy, family-friendly version at home. If I did the cooking for our family, this would be right up my alley! I love this idea. Thanks for sharing. I am wondering though about the risk of contamination storing uncooked vegetables with uncooked meat. Have you had an issue with this? I know the theory says not to store these items together in the fridge so I would think it would apply to the freezer. Really, though, I imagine it would get cooked off, right? Just wondering. I really don't have much to say about the cooking in our home so these matters intrigue me. So smart! I'm doing this Monday. just to clarify, do i split the ingredients listed to use in 2, 1gallon bags? or do is what's listed what is used in 1 1gallon bag and i need to double for 2 bags? i'm just curious like the sour cream in the goulosh, do i use 1/4 cup in each bag, or 1/2 cup in each gallon bag?? Thanks for the post…found you via Pinterest. To make it especially easy I think I might grab several bags of frozen veggies and divide them up per recipe needs. All the chopping (and blanching) is already done! @Jan…what a great mom you are! @CaroleM…let me know how it goes when you do it. @Anna…sorry to hear that. Let me know if I can help in any way. The curry is one of my favorites. @Beth, several other people have mentioned that, and I think it is ok, since it goes straight to the freezer, but if you hear of anything that contradicts that, let me know. @Charli..awesome! Let me know how it goes. @amypins…the recipes will fill two, 1 gallon bags. the sour cream is for garnish, after done cooking, so use as much as you want! @SharonJoy…that is an excellent idea, thank you!!! I'm super excited to find this post. I'm pregnant with our third and have two little guys at home (2yrs and 3½ years) so meals have become quite a challenge. I've been looking for prep-ahead & freeze slow cooker recipes but haven't found them anywhere yet. Yay for your post! I'll be working on these next weekend! 🙂 Thank you!! Just found this from Pinterest. LOVE that none of the recipes call for canned Cream of Chicken/Mushroom/Grossness. Am adding you to my feed reader tonight! Ditto that!! I HATE those canned cream “soups”. I can't believe I haven't thought of doing this!!! This is genius! Will you be posting more recipes? Please?! 🙂 PS Found you on Pinterest. love this idea! so great. how do i know how much stock or liquid to add to the recipes…if any? i have been unsuccessful in finding this?? Awesome post I will use this. Those recipes sound really good too. I am SO excited to try this! We are expecting baby number 2 in December and this will make the first few weeks SO much easier! One less thing for me to worry about once baby is here! THANK YOU! I am going to do this with my mother so that we can get a little more variety. I'll do three recipes and she'll do three then we will swap bags (or just get together and prepare them and take one bag of each, sounds more fun this way and we can enjoy the conversation and maybe a margarita or two…) I can't stand too much repetition in my meals so this is the only way it'll work for me (since it's just me and each bag will be at least 3 meals) but it's an awesome idea. Thank you so much. I already do this with casseroles (you should see my freezer the day after cooking day.) And think I may try to see if I can implement it with stir-fry's too. wish me luck! Found you on pinterest. Love this idea, thank you! Welcome to all the new readers from pinterest! So glad you are here. @Stacy… I have never heard of that before, thanks for the tip! I will look more into that very soon! Well you can buy chopped onion in your freezer section though at the store so I would think it's okay to freeze onions. I spend an entire weekend, twice a year, chopping veg for the freezer! Onions, leeks, celery and carrots mostly! You can DEFINATLY freeze onions!!! I parboil the carrots for a few seconds before freezing though…just because. I am doing this today…so excited! With two little ones and a husband who travels, this is going to make my life so much easier!! Thank you! Stephanie, thank you so much for this great idea and fantastic recipes. I plan to do this before the arrival of our second baby, however I just wanted to ask you what capacity slow cooker you have as don't they have to be at least half full to cook well? I'm going to go out and buy one this week! Wow, not at all bad! And it is even easier than expected! ^^ Thanks, favourited the blog. There are guidelines IF you are planning to use the veggies WITHOUT cooking/heating to a high temperature. Slow cookers reach high enough temperature to cook the meat, and therefore kill any contaminates on the meat itself as well as any drips on the veggies. The rules exist for the fridge because often you eat the veggies without cooking them fully (or at all). As far as onions, garlic, and other veggies being frozen- if you plan to use them RAW (or undercooked) they should be blanched first (dunked in boiling water for a few seconds) to kill off The onions you buy frozen in the store have been blanched prior to freezing since they can't be sure how you intend to use them. These meals are all meant to be cooked- so no problems here, no blanching required. I did the Barbecue chicken recipe last night, cooked 1 serving and froze the other, and we all *loved* it!! This one is totally going into my regular rotation! My husband would normally never eat zucchini or bell peppers, and not only did he eat everything in his bowl, he actually drank the remaining sauce! For us the 1 serving was just one meal for 2 adults plus bits for baby, since my husband is a big eater. And I used a full 15 oz can of tomato sauce and it worked just fine. Might add more chicken and sweet potatoes next time for a little extra food. Thank you so much for this recipe! I'll be trying the others soon! quick question – you don't add any water or stock to the crock pot for any of these once you dump them in the crock pot? LOVE this idea, would love even more to have a page of just recipes tried and tested by freezer –> slow cooker enthusiasts! Just throw all your ingredients into bag(except meat of course), put meat wrapped in plastic wrap or smaller ziploc into main bag and VOILA! A reusable / washable gallon bag and no contamination worries if the meat is sealed well. Keep on posting I love this concept of easy slow cooking without prepping each and every time. THANK YOU STEPHANIE. I am a college student that works and goes to school full time. Leaving NO time to cook healthy meals my mom is going to come over and we'll get these together I absolutely love this idea and the fact that It's in a crock lot! The freezing should prevent growth…I don't know of any harmful bacteria that will grow or produce a toxic if frozen, even on onions…if the final product reaches 165 f in a reasonable time it should kill any bugs…bacteria like botulism and staph produce toxins. Boiling takes care of that. Found this on Pinterest. Thanks for sharing. Love the blog. Can't wait to try this! 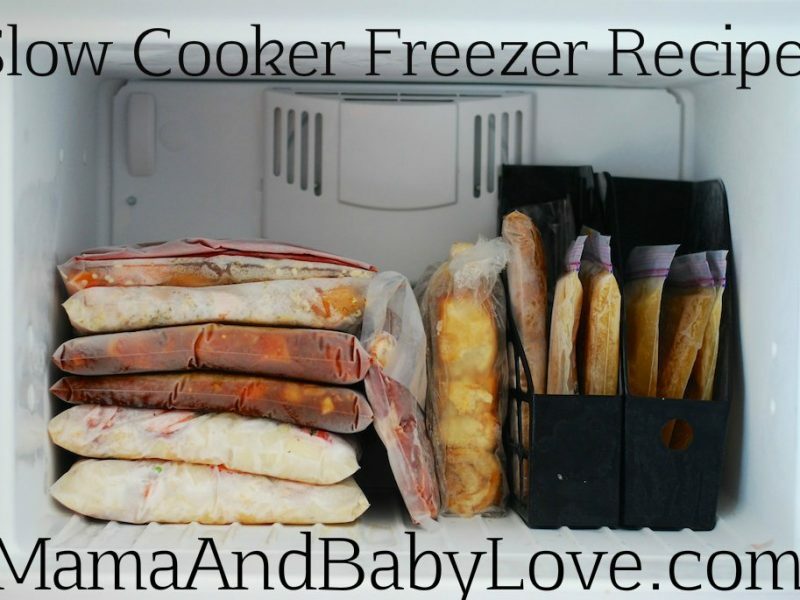 This combines my 2 loves: crockpot cooking and freezer cooking!! Thanks so much for sharing. I'll be checking back for more . . .
Just found your blog! Love doing freezer meal but have been looking for freezer meals that are healthy! These meals look great and can't wait to try it! Thank you! LOVE THIS IDEA! made a bunch of bags last week and we already ate 2! just a question: for the curry when you say bullion do you mean bullion powder (or cubes) or liquid chicken stock? hellooo… when you chop/freeze the vegetables, do you lose a lot of the flavor or get freezer burn on the veggies from freezing them? I so love this idea, with me working part time and the Kids in sports/dance it feels like I am scrambling for ideas and this is perfect. One thing your first recipe the Healthy Mama bbq chicken could I substitute the drumsticks and thighs for chicken breasts? Well you probably could but what would you suggest whole, strips, cubes? LisaMarie, Adam & Scarlett makes three! Brilliant! I did this today with seven other moms as aa play date. We each brought one or two things, chopped, and chatted. The kids all played and we each left with three bags of dinner! Just found you via pinterest! I can't wait to try this, I've been looking for good crockpot recipes but ones that can be all made up in one day is even better! Thank you! This is fantastic, I actually use a company in town that does something similar but you have to cook the meals step by step (which is still a huge help and I love the different meals available). Your system is even better b/c the crockpot cooks it and its probably much cheaper! I've been looking for something like this. Yay! "DON'T PUT FROZEN OR PARTIALLY THAWED MEAT OR POULTRY INTO A SLOW COOKER — they take longer to get to 165°F, and can also cool everything in the slow cooker. THAT'S LIKE BUILDING A BACTERIA PLAYGROUND." This sounds great. I have done freezer meals in the past but mine have always been cooked first before placed in the freezer. Don't you need to blanch the veggies first or is there really a difference from raw state? Thanks for the recipes I can't wait to try them. i found you via pinterest (like most everybody here!). this idea is great! in fact, i had these recipes in mind when i went grocery shopping today! Oh my ! I found you on pinterest and start looking into my fridge and pantry and found some items on the list ….. I went to Aldi's and bought everything including 1 galon of milk , plastic bags and spent $56 the only thing I changed was the chicken thighs …I'm using chicken breast I already have the chicken curry going. I love the idea of doing all the work in 1 day. I found this by Pinterest – I am heading to the store tomorrow to try all your recipes! I just bought a crockpot today so I am excited!!! YEAH!!! Thank you! Brilliant! Thank you for the recipes! Fabulous idea! love it! Totally going to be trying this out! I love planning out my meals and just began using a three month meal plan (first time). Excited to get my kids in on this "culinary activity". Then, they can say they "cooked dinner"! Awesome. Enjoyed your Healthy Mama Barbecue Chicken tonight… it was delicious and made SOO much! Easy, delicious and making my money go further… perfect! Thank you! Yes, this will rival electricity for sure! Thank you for the great idea. I have done the veggies before but never thought of adding the meat too! SOme die-hards don't use any plastic, but glass to store their foods. DO you have any feelings about that? 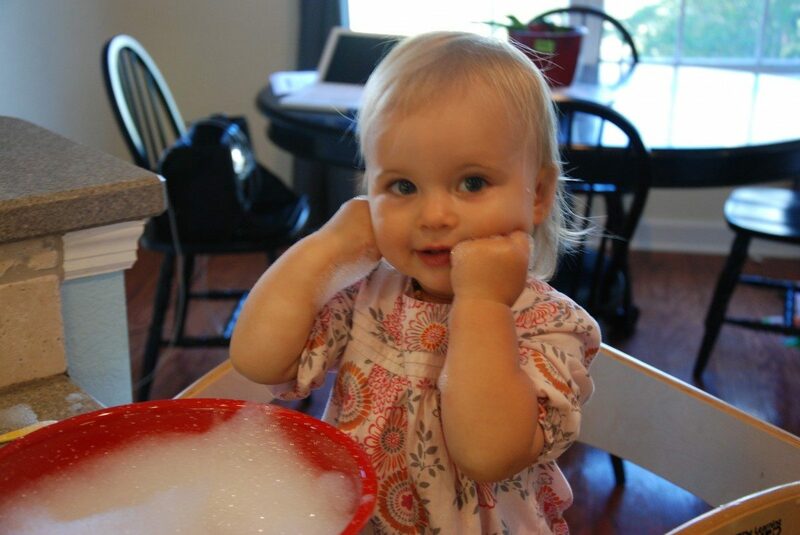 @foodfunfamily…that is wonderful you cook with your kids, it is so important! @Lore…everything I have read says that using plastic bags in the freezer is fine. It is the heating food up in plastic that is bad. One day I would love to use all glass just to be on the safe side. I would never use those slow cooker liner bags, though!! @Cammi…yay! so glad to hear! welcome! Wow – just found your post & blog via a facebook discussion! What a great idea! I can cope with chopping and bagging it all up 🙂 – Thank you! Wow. Thanks so much for sharing your recipes! I just started freezer cooking and this is absolutely genius!!!! I also try to get the veggies in at dinner. I can tell these are delicious. CANNOT wait to try them!!! Thank you!!!!!!!!!! Omgaaaaaaaa! bless you! So need this in my life right now. You just made me a superwoman:) I can do all things!!!! Im gonna try some of these recipes. So excited to this! Ok, I've always heard you're supposed to blanch vegetables prior to freezing them or their cells will burst and will be mushy. How do you get around that? So I don't have to cook the chicken before I freeze it, right? To clarify, I have chicken in the freezer. Can I thaw that, add the veggies, and then re-freeze it? @Lissa…they do get kind of mushy, but I like them like that, easier to digest and one less step to do! @Kristen Elizabeth…I would just make a separate bag of the ingredients other than meat. Then the day of cooking, just dump both bags into crock pot. You are not supposed to thaw and refreeze meat. I just went out and bought everything to make the BBQ & Curry Chicken… but I have the following questions..
1. does the chicken for each recipe have to be skinless? 2. can I leave them whole or do they have to be cut for either recipe? This is great!! Do you have any additional recipes? If you do could you email them to tiffany . wood @ live . com ? We haven't even tried them yet– I'm typing while my husband is chopping! But we'd love to do more of these recipes– have you tried any others? With a 5 month old teething, cooking just doesn't happen unless we plan ahead like this! How much liquid does each bad need for cooking? I see that this question has been asked several times and never directly answered. Thank you. @Shannon…I don't think it matters. I have done skin on before and it is fine, but I think its a matter of personal preference. And you could leave them whole, people cook entire chickens in the slow cooker, so I don't see why not! @Tiffany Wood…yes, I do! please check out my real food tab at the top of the blog. @CrunchyMama..I hate teething with a passion, good luck! This is an amazing idea, and the recipes sound great! I may do this over the weekend. I love chopping veggies, but am not a fan of chopping meat (like you). Do you cook the meats before freezing or just chop them up? In the Chicken curry how much chicken bouillon? I have the cubes. I loved this idea so much I ran out to the store the next day and stocked up on all the ingredients! But, in my haste forgot the freezer bags…haha, oops! I chopped and bagged them all up at the end of last week. We have had the BBQ chicken and having the chicken curry tonight! These are FABULOUS and a life saver. It is so nice to just throw it in the crock pot and turn it on. I dread cooking dinner each night and have been looking to change that view. In looking for ways to help my transition I stumbled upon your blog via Pinterest and you have inspired me! I am learning to cook healthier from my family and surprisingly, am loving this new way of life! It has added an entirely new dimension to the way we take care of ourselves. So do you cook the meat? then add? Just found this via Pinterest… OMG love this, will give this a go to save time! Thanks for sharing! I've stumbled this now to share with my followers! @Elizabeth… you are so welcome! @Courtney..so glad to hear you are trying to cook healthier, your family will thank you one day, I am sure. @Eileen…the meat is frozen and then cooked the day of cooking. @Rhonda…you assemble the raw meat and the veggies together, then freeze, then cook the day you choose. @Unkown…essentially yes, as long the recipe doesn't call for browning ahead of time. And really any recipe can be converted too. I am realizing that most everything can be frozen and be cooked in a slow cooker. @Brit Greek…thanks so much for sharing!! Thank you, thank you, thank you! Every meal I have made from your recipes has been so delicious! You are amazing! Thanks for sharing such great meals and ideas for making busy mom life easier! SO doing this. We're planning to CONCEIVE this fall so to find this now is… super valuable to say the LEAST. Our deep freezer will be F-U-L-L like my belly soon enough. Oh my gosh ~ once a month cooking is far to overwhelming for me, but as a nursing student, wife, and mom, and I can do this! I stumbled upon this via Pinterest! Made the goulash tonight, and we really liked it even though my husband doesn't care for beets. Thanks for posting this. I came across it when I was looking for prep ahead meals. I love it even more for being a slow cooker recipe. I needed some slow cooking inspiration- thanks! Just curious on the goulash recipe- do you put the hot pasta in right before eating? I would think the pasta would get really mushy after being in a crock pot for 4-8 hours in the frozen mixture. Just wondering! Brilliant in it's simplicity and I love the rustic vegies as well! Are Reynolds Slow Cooker liners BPA-free? Yes. Slow Cooker Liners are BPA-free and approved by the FDA for cooking. We have been using them frequently, it is such a time saver! I look forward to trying your recipes and freezing technique. Thanks! Just made these today! Thank you for sharing your recipes. I opted to put the meat, spices, and sauce for each recipe in it's own smaller bag and then put that bag down inside the gallon bag with the veggies. I don't think it would really hurt if the raw meat and veggies mixed but just wanted to be on the safe side. Hi, I know I have read that you don't precook any meat before you put it in the freezer bag but I thought you were suppose to cook ground beef before you put it in a slowcooker. Wow. This is brilliant. I love slow cooker recipes, but I haven't been using them enough lately. This is fantastic inspiration. I also found you on Pinterest. I am a mother of 2, a postpartum doula, and I'm about to finish my last semester of nursing school. This idea will help me and my clients so much! Thank you! you are a genius, I am going to try this and will report back. Thank you for sharing. That you so much! I am past all of the baby talk but the food is GREAT!!! I just tried some of the recipies today for the first time and tomorrow I plan to do some more. Can't wait to just head to the freezer in the morning and have dinner when I get home! Hopefully this will cut down on the eating out and help with the Family weight loss goal. Keep sharing! found u thru pinterest, u r an inspiration! Do b careful putting frozen raw meat in crock pot. Id only use smaller cut-up pieces not whole cuts like breast or thigh as u want them to become hot enough for long enough to cook thru & kill bacteria. Freezing slows growth of bacteria but does not kill. If possible, i cook on high fr @ least an hour 4 all recipes to get up to temp to kill bacteria. Can't wait to read more of ur blog. And try the recipes. If i only could b so organized, esp w a baby! I'm really excited about this. Just a little confused. Re: the chicken curry recipe. What liquid do I add once I'm ready to cook? Thanks for these great ideas! I look forward to using them! I just spent a gratifying couple of hours putting the first two of these meals together and in the freezer. I'm looking forward to using one this week! Since I wasn't sure how to split one whole recipe between the two 1-gallon bags, I filled them up along the way, halvsies. Then for the spices/sauces (tomato paste for the one and tomato sauce for the other), I mixed it all together in one little bowl and split the mixture into the bags. I hope I haven't jipped one or the other on saucy goodness – but I'm so looking forward to this. . . Thank you for using whole, real foods in a crock pot without any processed crap! Ok, I will be the 217th to sing the praises of your ingenious idea! I can't tell you how excited I was to find the recipes and your ideas someone had posted on pinterest. I just got done, putting together the BBQ chicken, one bag to eat tomorrow and the other is frozen. Do you think the bag that's not frozen would take less time to cook? I am thinking I will check it after 6 hours on low. I can't wait to try it. I am thinking to get the picky younger ones to eat the Veggies, I might stick some of the cooked veggies in the blender to grind it up. Might thicken up the sauce and hide the veggies from plain sight. A little about me…I am a full time working mom with 3 small kids and I have rheumatoid arthritis. I love to cook but it's getting increasingly harder to chop. It won't stop me though from trying healthy meals for my growing boys. I am an avid recipe collector and love to try new things and especially recipes for the slow cooker. While it took me 2 hours to get everything ready for just one of the recipes, I think it's still a huge timesaver and hopefully friendlier on my hands to chop once and get two meals. Keep up the great work, I look forward to trying more recipes. Thanks again!! Steph – I found this on Pinterest, loved it and clicked to the site and it's YOU!!! What a small world. You have a new blog follower. Wouldn't the noodles be mush? I see snap peas in your picture, but none of the recipes call for them. Did you just add them to a recipe? Why not double batches in slow cooker and freeze the rest. Nuke the frozen PRECOOKED meal…ready in 10 minutes. Much easier than having to cook every day. I thought it was unsafe to cook frozen raw meats in a slow cooker? I know that the slow cooker cookbooks I have read have said absolutely not to because the meats are at unsafe temperatures for far too long and harmful bacteria can grow. Is it safe to put raw meat in the bag with the vegetables. I understand that it is all being cooked and tossed in crock pot while raw but I was wondering of the safety of it sitting in the bag waiting to be frozen and while defrosting with the veggies. Should you put the meat in a small ziplock and then place it in the bag with the veggies to avoid cross contamintation? can this procedure done with stews and soups? I wanted to plan out means for a couple of winter soups. I just didn't know if freezing stock was okay. Thank you so much for this great idea! Makes things so much easier! This would also be great for church members who need to provide meals to new moms or someone having surgery!!! Thanks for the great ideas!!!!!!!!!!!! Stephanie – the problem I seem to have run into is not enough liquid. I'm assuming the recipe for the BBQ Chicken is two meals worth? Thank you not only for sharing these great recipes/ideas, but also being so conscientious to reply & post comments, too. If I am reading correctly I don’t add any liquid when I’m putting these into the crock pot? I just found you and made up the BBQ Chicken and the Goulosh recipes and put them into the freezer. Neither of those recipes called for any extra liquid. Also did I read that you did not put the noodles in the Goulosh before you froze it? That is correct! I find that when the liquid from the meat and veggies defrosting is enough. But depending on the size of your slow cooker and type you may need more. So just watch it and see, add .5 cup of stock at a time, if you need more liquid. And yes, I add noodles the day of cooking, not in the freezer bags. Love this idea! My kids are older but doesn’t mean time is anymore available. Between my work, the kids’ practices,the kids’ homework, etc. life is busy and planning for dinner is tough. Thanks so much for this neat idea. This is genious for anyone who is super busy and likes to eat healthy! I cook meals sunday evenings to take for lunches the following week… I am definatly going to try all of these 🙂 Thank you! I am definitely trying these recipes! It sound wonderful, healthy and worth the time investment! Thank you so much! Coming soon, promise! I even have an ebook in the works!! Each of the recipes calls for putting it in 2 different bags. Do you cook the 2 bags together at once in the slow cooker or is each bag its own meal? Thanks! Good question! No, you just put one bag in the slow cooker at a time. Hi – Would it be possible to UPDATE the recipes with all the questions that are asked an that you answered so all the details are in the recipe instead of reading through all the comments. That would be of great help (ex: questions about the stock, serving size, noodles, etc). I have been finishing up that very thing! Life has been so busy lately, that I haven’t gotten to it sooner. It will be up very soon, promise! When you say “green pepper” and “red pepper” do you mean bell pepper? I do not, but when I come out with my ecookbook, that is something I plan to have in it. What a fantastic idea! I always end up in a tizzy on slow cooker mornings trying to figure out what to pop in there that I actually have all the ingredients for. What a life-saver this will be! So excited to try these out! Thanks for sharing! I know what you mean, I used to be the same way any time I tried to use the slow cooker. What do you use for liquid?? If the recipe calls for it, I use stock. If not, the liquid from the frozen foods melting, seems to be enough for me. I found your blog via Pinterest as well! Spent Sunday morning preparing 8 different freezer meals (doubled most) and have bbq chicken in the crockpot today. I have a 4 month old and just returned to work full time, so this will be a huge time saver in the evening! Look forward to more yummy freezer recipes! Oh man, what a time of transition in your home! So glad I could be of help! And yes, more recipes coming soon. Can this be done with any slow cooker recipe or do I need to be careful with what I freeze? I just found this site on Pinterest. I am going to check this out. It is great to get the kids involved. My girls love to help me in the kitchen!!! I am a full time Mom, student, and athlete. I love that these are nutritious and fresh!! Thank you for sharing your recipes. Thank -you!!!!!!!! I am mom to 3 kids & live in mom for 8 developementally disabeled adults. My baby is 10 months old now so things are getting better again, but my time is soo precious & I cook 3 meals every day. This is going to be sowonderful for me! I LOVE my slow cookers!! Waiting anxiously for more recipes!!! I just found this via Pinterest and love it. I already make doubles or triples of other meals so I can freeze them in smaller portions like Lasagna, spaghetti sauce, casseroles so this will be another great and easy pull out dinner. Can’t wait to try them. One question do you cut up the chicken thighs or throw them in whole? I bagged 2 veggies with stew meat…I think I made enough to feed the Jolly Green Giant..I forgot to add spices..I’ll do that when I put in crock pot….Does it matter which veggies go in 1st and does meat always go in last? Love your site..It gave me such inspiration..You Rock! This is such a great idea. I was wondering if you blanche the veggies before you freeze them because I didn’t see that in the instructions. If you don’t blanche, how do the veggies turn out? I am concerned about changes in color, taste, and particularly texture since the enzymes in the veggies could decay the veggies if frozen without blanching. I don’t blanche them, and they taste fine to me! This is so terrific. I found you via Pinterest. I absolutely will be trying these! Thank you so much! I found you via Pinterest and thank the god I did, I am a full time nursing student and I work part time at a hospital and cooking is the last thing on my mind. I want to eat healthier but there is no time, you are a life saver, I cant wait to do these!!! Thank you !! If you check out the Real Food tab at the top, there are several more recipes listed and more coming soon! I’ve been working on a slow cooker demonstration and found your website. I have one recommendation for you. Food handling instructions for the slow cooker are pretty clear that food from the freezer or even partially defrosted food from the freezer should not go directly into the slow cooker. I’d advise you to change your defrost instructions to tell people to use the fridge as a defroster for 12-24 hours before they plop these recipes into the slow cooker. Thanks! Hi, thanks so much for sharing your wisdom! I did a bunch of your slow cooker meals a few days ago and cooked up the first one for dinner tonight. We had Stephanies Goulash. My husband really liked it! My kids and I….well I find it a bit bland. I’m just wondering if anyone has any suggestions for more seasonings that would compliment this recipe to add a little more flavor other than just salt? I love this idea, but can you do the same for beef stew and vegetable soup? After seeing so many slow cooker recipes out there lately I wasn’t sure how I was going to prep for the challenge and then I found your blog! *and I am so glad I did!! * I spent 2 hours today prepping and made 12 huge meals!! I put them all in gal. ziploc bags and can’t wait for all of our new dinner adventures! I even cooked a whole chicken in the crockpot tonight for the very first time in my life! (I didn’t want to go the raw chicken route & thought pulled chicken would just as well) Thank you so much for this post! I’m looking forward to more of your recipes. On the chicken curry recipe, when you say “1 chicken bouillon,” do you mean you just added a bouillon cube to the bag, or that you made 1 cup of bouillon and added THAT to the bag? I’ve tried the chicken curry and the BBQ recipe. They were delish! I like the curry more than the BBQ, although my husband loved both. Will adding water to the curry make the sauce thicker or do I need to add more spices as well? I am going to try adding a bit more garlic to the BBQ to see if I like it better. It’s still delicious, though! The curry tastes just like the japanese curry packets at the store! In answer to some of the questions above, it IS ok to freeze raw meat and other ingredients together, as long as everything is being cooked together and reaches the proper cooking temperature for the meat, within the proper amount of time. So ordinarily, you would could cook vegetables to whatever temperature you wanted to, but if you are mixing them together with meat, everything needs to reach the temperature requirement for the type of meat you are cooking. Hopefully that makes sense! It is also generally considered unsafe to put frozen ingredients in a crock pot, although I know people do it. It is safer to thaw in the fridge over night and then add to the crock pot. I found your website through Pinterest – great ideas! Thank you for sharing!! I bagged up the chicken curry and chicken BBQ this weekend. I put the chicken curry in the crockpot this morning, came home, smells great, but looks horrible 🙁 Just no liquid to keep it all from drying out. Now I did have to skip the mango do to my inability to chose a good one (had to throw out the one I bought it was bad) so I’m wondering if the mango cooks down to become the liquid? If that’s the case I need to get a mango to add to my other bag. You mentioned the liquid from the veggies was enough to make it liquidy, but for 8 hrs on low there needs to another source. Suggestions are very welcome! Thank you! I think I know what went wrong, crockpot insert had a crack 🙁 and leaked all the juices out. Not to worry I have another crockpot, and have ordered a new insert. I tried the Healthy Mama Barbecue Chicken last night and loved it! The only thing I did different was add yellow squash and omitted the tapioca (didn’t have any on hand). This is definitely one of my new favs. Thank you so much for sharing. Can’t wait to try some more. Hi I just did the same thing and blogged about it a few days ago, then a friend pinned yours on Pinterest. Thanks for so many new meal ideas. I’m going to do another day of this type of preparation this weekend following some of your recipes. I found your recipes on Pinterest! I wanted to know what the cooking time was for the recipes? I read through the blogs but didn’t find any instructions. Hi Annette, they are at the bottom of each recipe. 4 hours on high, or 8 hours on low. But each slow cooker is different, so watch yours to be sure. Wonderful! Thank you so much! I patiently tried to read every comment but got about 2/3 through and just wanted to ask: Have you run across ANY kind of vegetable that you wouldn’t recommend freezing? Like cabbage or something? Thanks for the recipes! However, 2 of the 3 don’t have any liquid ingredients mentioned or listed. Can you please post them? Thanks! I so wanted to like these, because it’s such a genius idea and I am a BIG fan of Crockpot cooking. But… I just didn’t. 🙁 Like another poster said, all of the recipes seemed so bland. I followed each recipe to a T, and each time I came home to the house smelling delicious, I was disappointed that the food didn’t taste as good as it smelled. I don’t ever add salt when I’m cooking anything, so I don’t think the lack of salt is the issue. Everything just tasted very blah — there was no real distinction between the flavors of the chicken and the sweet potatoes and the other veggies. I don’t usually have that issue with Crockpot cooking. That being said, my boyfriend and I ate all of it each time and never had any leftovers, but I don’t think I will be making these recipes again without making some major adjustments to the spices/seasonings. No disrespect intended. Thank you for a great idea! I h ave to agree here. I was thinking it was just me andmy family. It smelled delish (BBQ chicken) it was a total waste of food. So bland and just plain yuck. I am reading these comment swith the hope of seeing what I was doing wrong but generally I am a good cook. So sorry to hear that, I loved the BBQ chicken dish! I just found your website thanks to Pintrest. LOVE IT, can’t wait to get to the store for supplies. Thanks for the idea, it will be great to finally be ahead of the game for once. Don’t you love how people steal your ideas without even giving you credit? This woman even calls it Stephanie’s Goulash without acknowledging who Stephanie is… Had to bring it to your attention. Found her on Pinterest. Coincidentally, I am getting my shopping list ready for this week, and looked at both of your sites (yours, of course, I already know and stalk, er love!) ! Don’t think there’s any competition though, her site is not very nice! I know! I saw it yesterday on Pinterest and about lost my mind. I have commented a couple of times on her blog asking her to at least put a link to my site in her post, but no response yet. It is such bad blogging manners. Hopefully she is just new to blogging and just doesn’t no any better and will give me credit soon. I found Melissa’s freezer crockpot meals on Pinterest. I went to her site, read her post, read the comments, and then clicked on one of the three links I found to your blog. Which led me directly to this page. I don’t know you or Melissa, but I think one reason she may not be responding to your request is because there are THREE links to your site in her post, and she gives you credit multiple times. Just saying. BTW, I am excited to try recipies from both of you! It only took her one day to respond, she put the links up today, hooray! I made 3 meals yesterday during the football game. Had so much fun! (except now my fingers smell like onions!) I prepared the chicken curry, BBQ chicken and teriyaki chicken. Great use for that huge 10 lb. bag of chicken breasts from Costco. Yes, I saw that she updated it today, hooray! I can’t seem to see more than 3 recipes. What am I missing? I loved reading this and it provided much inspiration, thank you so much! One question: because everything is so nicely contained in bags, would it be possible to chuck the whole back (still zipped) in to the crock pot to make for easy cleaning afterwards?? Can zip-top bags hold up to that? Hi Susanna! Love to have a local reader, welcome! My sisters and I got together a few weeks ago and put together a bunch of recipes for freezing and then we each got some of every meal, it worked out GREAT! However, one of the meals I made was the Healthy Mama BBQ Chicken. Made it last night. The taste was just ok, and the veggies were pure mush. I won’t be making it again. Pulled it out of the freezer and let it sit for about 30-40 minutes, then dumped it in the crockpot on high for 4 hours. Then it sat on warm for about 20 minutes waiting for my husband to get home from work. Not sure if something was done wrong?? Yeah, the veggies do get mushy. I like them like that, but I also always serve the meal with rice or cous-cous to add in texture. I did this the past weekend it was not hard or stressful like I tht it might be! I’m lookiking for more recipes to do it again. Each recipe gave me 2 gallon ziplock bags. I have the bbq chk in the crockpot rt now while I am at work. THANK YOU. I spent the afternoon making 8 crockpot meals, 7 are in the freezer and 1 of the Healthy BBQ Chicken meals we had tonight. It was delicious, but the veggies were all mushy. I served it on wide egg noodles. Very yummy, and looking forward to trying the others. Wondering if you could add the veggies for the last hour, or if that might take away from the flavor. I am not sure, try it and let me know! I now have 7 crock pot meals in the freezer…so excited! I cooked one of the BBQ chicken recipes and it was delicious. I didn’t like that the veggies were very mushy, but I served it over egg noodles and it still tasted yummy. That is exactly what I do. When the veggies are mushy like that, they are much easier to digest and won’t give you gas, so at least that is a plus! Have you tried the slow cooker liner bags? Was wondering if it would work to put all ingredients in one of those bags, twist tie it shut, and then just throw that bag in the cooker straight from the freezer…. hmmm… must test their “freezer burn avoidance” ability…. I found you tonight through Pintrest, as many others have already said, I have enjoyed many of your blogs tonight. I am very impressed with you and how you live your life, you are quite inspiring to me. I plan to try some of your recipes, I have been looking for a way to get stated freezer cooking and your plan/recipes appears to be the perfect place to start. Thank you for sharing all this with us- your blood, sweat, tears, and recipes will help make us all better cooks. Thank you so much! I can’t wait to make some of these for my husband and young children. Aw, thanks so much Lori. I love what I do, and I am thrilled that others feel connected to this blog. I am so glad you are here. I am not sure if this was asked, but I am assuming nothing is cooked, everything in the freezer bags is uncooked while frozen, thawed, and then goes in to the slowcooker? It depends how big your family is. For us, a family of three it is dinner and lots of leftovers. I go over it more on the FAQ page. Thank you so much for this idea, I have a two year old and 3 month old and this has saved me so much time and stress in the kitchen. Thank you thank you thank you ! Hi! just discovered this from pinterest and I love the idea. Although I like making my own recipes, how do you plan out your meals and grocery list so your not running back to the store all the time from stuff that you forgot. I love the idea of the once a month cooking, but actually doing it is difficult! Please any tips would help thank you! Hi Shanda. I just always make time to sit down and really think about my grocery list. I go through all the recipes I plan to make and tally up the vegetables and amount of meat I need. And then go to the store with one big list. I am a pretty organized person, so for me, its just a matter of making the time to pull my thoughts together. I will think more about how I can translate my thought process a bit better and see if that helps anyone. Hi! I am trying your BBQ Chicken today, its in the slow cooker as we speak! Does it matter that I won’t be there to stir it during the day? I work about 45 mins from home so I stuck it in the slow cooker while it was still VERY frozen this morning and have it set on a timer to start cooking on low at about midday. My slow cooker is a little hotter than most so I think I will only need 6 hours to cook it. Fingers crossed I come home to an amazing meal! Thanks! So cool to have people all over the world read my blog. I only stir my slow cooker once. If you constantly stir it, it lets too much heat escape and it won’t cook properly. So no stirring should be just fine! We had it for dinner last night and it was so yum! A bowl of it with a slice of buttered bread was perfect! I’m looking forward to trying some of your other recipes! Thank you thank you!! I do a once a month freezer meal exchange with my neighbors and this will be perfect!! thanks again!! This a great idea for people like me w fibromyalgia! I feel like a failure as a mother of 5 boys when I can’t cook supper! This way, on a day a feel good… I can load the freezer up & we can always have supper! Thanks for the idea! So glad to hear that this has helped you!! Thanks for this. I haven’t had a chance to read through the whole post. But I’m planning to do this, this week! I love my crock-pot! and I’ve just discovered the pressure cooker which is great too! Tried your Healthy Mama BBQ Chicken and it was delicious. Thank You! I love how “saucy” it is, as it serves well with rice. I made your Chicken Curry and it is in my freezer ready to cook and eat but I was wondering if I would have to add any liquid before I cook it! I don’t. But if you like your sauce a bit thinner you could add a half cup of water or chicken stock till it get to the consistency that you like. Sorry you had a bad experience. My veggies always come out very soft, but they always taste delicious. Adding the vegetables the last hour or half hour is a good idea to try. Let me know how it goes. I am going to make the chicken curry, but I am new to this and was wondering if the raisins and peanuts go in the crockpot? Is says garnish, so does that mean I add THAT part before serving? Hi Amy, the raisins and the peanuts go in when you are about to serve. Not to be cooked in the slow cooker. This is probably a silly question… but do you have to add any water to these before cooking? No silly questions here! But no, if the recipe does not call for a liquid, it does not need it. I go over it bit more on the FAQ page (link is at the top of the post). Hi, I’m new to your blog and I really like it!!! Question: Do I have to use a slow cooker? Can I use a pressure cooker? Or can I use a regular pot? My husband refuses to use the slow cooker while we’re at work, he’s afraid it would spark a fire. So I use it over night, but the food in the fridge and reheat on a pot when we get home. Plus how much energy are we spending using a slow cooker for 8 hours?? I really appreciate your feedback. Thanks. Honestly, I do not know the answer to either of your question. I imagine you could do it in a dutch oven, but I have never tried it. I have no idea how much energy it takes up. I would think that it would be less than an oven though…I will ask my environmental engineer hubby. Lily, don’t use a pressure cooker, it’s a whole different thing and may very well turn your food to mush. I think the point of a slow cooker is that you don’t need to watch it or worry about too much direct heat burning the food in some spots, while at the same time using less energy than the oven. You can do it on a stove top, but as I said, that has the drawbacks that led to the slow cooker being made. The recipes will work just as fine in other cooking mediums if you adjust for temp/cooking time. The Chicken Curry was delicious! I added some plain Greek yogurt for garnish. The process took me about 3 hours, but I think it was well worth the time’ I love knowing I have a few ready-to-go meals in the freezer. I made the goulash this week but wasn’t home to test it, my husband said it was good. Thanks for sharing these recipes/ideas. I found your website via Pinterest and have prepped for the Healthy BBQ Chicken and the Goulash. Can’t wait to taste them! Thanks for all the recipes. Are there any issues with throwing the raw meat and raw veggies in the bag together? I didn’t realize when I first started looking in to this that the meat was raw. Would the recipe work the same if you packaged all the meat in a separate bag and then threw both bags in the crock pot on cooking day? Is there a reason that the meat would need to be in the bag with the other grocery items? Question about the goulash recipe . . . does it call for 4 cans of tomato paste (24 oz. total)? Just a quick question….since each recipe is dumped into 2 one gallon ziploc bags, do you put both bags into the crockpot, or just one at a time. This is such a great idea…I am glad I found it. I am due in 10 weeks, so this is a project I am going to make myself do before the baby comes. Hi! I love your ideas! I am putting together a list of crockpot freezer meals I plan to give my pastor and his wife when their baby is born in September. (I still have lots of time). I am trying to decide if I can use some of my favorite crockpot recipes like this..Some of my recipes call for cream soup added in with the veggies and meat. Would you know if i can add that before freezing? I have picked several of your recipes to use also, but do have a couple Id like to try to freeze…Thanks for sharing this awesome idea! I have made freezer meals with cream soups before and they’ve turned out fine. One specifically I can think of is a beef stroganoff that used cream of mushroom soup. Love doing crock pot meals! Ok, I just read through basically all comments! My eyes hurt!! lol Anyway, I read how a few people mentioned maybe adding the veggies a bit later. Has anyone actually tried this and seen a difference in consistency? i.e. less mush, more crunch? I mean, I don’t need so much crunch that it’s basically a raw veggie, but I do like my veggies a bit more firm than mushy. Also, I was wondering if anyone was able to determine which was better… to throw in frozen, or to thaw in fridge first? Another blog I have read (one that indeed credits a few of her recipes to your blog Stephanie) says to throw in the fridge the night before. Thanks for sharing! That’s my kind of cooking-dump the back in a crock pot and hit start. Can’t wait to try out your recipes. Made the BBQ Chicken tonight – YUM YUM YUM!!! Great hit with hubby & 15 month old. Looking forward to making some more of the recipes. Awesome! Thanks so much for letting me know, makes my day! Has anyone tried or think it would be possible to freeze any (or almost any) crockpot meal ahead of time? Or are these somehow formulated recipes to survive the freezer? Obviously this post was a hit!! Why did I never think of this?! We love to use our crockpot, and it’s just coming up to winter, so this will be amazingly useful! I will try the same with some of my normal crockpot recipes also. Thanks so much for sharing. So, I decided to give this a shot. Along with two of my own recipes that were freezer worthy, I made the BBQ and the Chicken Curry. However, I ended up with a happy accident. For the Chicken Curry, I accidentally put in chili powder instead of the curry powder. It ended up being delicious! Since no liquid was called for in the curry, when I threw it in the crockpot, I included a scant 1/3-1/2 cup of water. I served it with the last of my white jasmine rice (I know, I know, brown rice is better and I had to finish off my white rice so it would stop tempting me). Oh, and whever a recipe calls for sweet potatoes, I usually use Red Garnet Yams (same family). Thanks Stephanie for your great recipes and ideas and now I no longer have to worry about the dreaded “What’s for dinner?” I love to cook, but don’t always have the time I’d like to dedicate to cooking. I bet it tasted great with the chili powder! So glad to hear! This is such a fabulous thing to do! You absolutely rock! I have a question… if I wanted to make some of my own crock pot recipes into these freezer meals, how do you know what ingredients can be included and what should be added later? You would just have to come up with it by trial and error. In the my ecookbook that is coming out soon, I will go over a few techniques about how to adapt your favorite recipes. Thank you for these quick and easy slow cooker ideas! I am currently preparing for a whole body scan and have to be on a low-iodine diet for two weeks in order to deplete my body of iodine. This is because I need to take a radioactive iodine pill before the scan to help detect any cancerous tissue that may have been left behind after my thyroid was removed. I was in the middle of my monstrous grocery list consisting of fresh fruits and vegetables(I can’t have anything from a can or box)when I decided to take a break and check out pinterest, and there it was; bags upon bags of veggies to freeze and cook! Depleting your body of iodine creates exhaustion and causes you to become very lethargic. These recipes are Heaven sent! Since they are already prepared, I can just pull one out and throw it in the crock pot when I am too tired or disoriented to cook. I will just have to tweak them a bit to make sure there is no salt in any of the ingredients. Many, many thanks to you!!! This looks great. My only concern is (and I am old;and things may have changed) I was taught that many veggies have to be blanched before you freeze them. I never blanch peppers, or onions; but things like carrots green beans and and broccoli I thought had to be blanched. I am hoping to hear that I am wrong, and to save my self a lot of time and energy. This would be great for me. I am vegetarian and don’t have to handle meat. I really think it is personal preference. If you have the time and inclination to do it, go ahead. I don’t find that it makes any difference at all, with slow cooking. Sautéing or baking the veggies, maybe. But in a slow cooker they all turn soft, so why take the time for an extra step. Hey I love your site!! Silly question but with the bbq chicken do you put it into the crock pot frozen? I saw that the last recipe said to let it thaw, but the other two didn’t. I found you on Pinterest and have decided to stop scrambling over dinner recipes when I finally get home from work and i KNEW i had to read up about your freezer style recipes. thanks so much!! I tried your Chicken Curry recipe tonight and my husband said it was the best thing I have ever made! Thanks for sharing this delicious dish! Hi: I stumbled upon your site on pinterest and I LOVE it. Live in the high arctic where things are expensive, and often unavailable. Group of teachers are taking this idea and doing a food swap with it…we are all preparing a freezer meal…I’m doing chicken curry. I’m confused about the liquid though….just a chicken boullion cube added to the bag? not dissolved in any liquid? and if not…do you add any to the crockpot when you dump it in to be cooked? I made the BBQ Chicken tonight, it was great! Even my picky husband liked it, I will definitely make again. Only thing I accidentally did was grab cubed butternut squash instead of cubed sweet potatoes at the store, so I tried it and thought it worked. I will make it properly with the sweet potatoes next time to try the proper recipe, but the squash added a nice fall type flavor if you are looking for a small change. I bet the butternut squash was yummy, great idea! Yay! Thanks so much for telling me! My ecookbook with new recipes is coming out soon, so stay tuned! Wow. Have never seen cooking like before! Fantastic. Love your recipes too. Some of the ingredients I dont think we can get here in New Zealand but I will make do. This is perfect timing as we are coming into winter and everyone loves a good crockpot meal in the winter right?! Which ingredients do you think you wont be able to get in New Zealand? Hi there. I found you on Pinterest. I used some of your recipes last week to put together some freezer meals. I was not as organized as I should have been but with a little tweaking this is very doable for me. Thank you so much for the inspiration. I threw the chicken curry in my crockpot today. It is fantastic. This is one dish we will definitely be adding to our rotation. I can’t wait to try some of the others now. Yay! So happy to hear that! Thanks for sharing and welcome to Mama and Baby Love! Thanks so much! I ended up with way too much onion (not sure how I did that). What I did to solve that problem was portion the diced onions into 1/2 cup servings in snack sized baggies and then stack them into a larger freezer bag that I labeled and dated. I felt really smart (and found other people had done similar, so go me). Now when I do my next batch of freezer cooking, I have some onion ready to go. Super excited to try this..just one question: are the recipes for one bag or two…i.e. so I would cut the recipe in hald for each bag? That’s correct. Each recipe yields two bags. You are my saving grace, this is a GENIUS idea, I don’t know why I haven’t thought of it before! I will be cooking for my working daughter, and thought this would be a great way to do most of the work at my house and then drop it off for her teenagers to finish in a crock pot that I will leave there. My question: about how many servings are in those gallon size bags? It’s hard for me to figure by looking at the recipes. Thanks for this great idea! Am I missing something? Was I supposed to thaw before putting in the crockpot??? I put the bbq one into 2 bags but I couldn’t get it out of the bags and had to use scissors to cut it out, then it wouldn’t fit in my crockpot because its like a huge brick and 2 of them would no way fit in the crockpot (I have a 5 or maybe 6qt). Are you only using one bag at a time? Maybe it would have fit if I wasn’t trying to do both but I didn’t split my ingredients evenly between the bags (I thought that was too hard lol). Oh girl! You gotta read all the way through next time! Yes, it is only ONE bag per slow cooker. And if you don’t have a larger slow cooker like I do, you should let it thaw for a few minutes, just enough so that you can break the brick up with a wooden spoon and get the lid on. Live and you learn, next time you will be a pro! Where does it say only 1 bag at a time? I just see “dump it in”. Oh well, I thawed them and broke them apart so they both fit lol. I anticipate having a lot of chicken bbq hahaha. I meant read through all the comments! Several people asked the same question. 🙂 Well, you can refreeze what you cook if you have lots of leftovers. I love this idea!! I have 4 kids (5 including my husband..LOL) and just started back to work after 13 years of being a stay-at-home-Mom. It is taking some adjustments on everyone’s part..but I do believe that these are easy enough for my husband to do 😉 Would LOVE more recipes! Greeeeat idea! I am pregnant and trying to load up the freezer before baby comes. Just a question about cooking raw meat from frozen…if you don’t thaw it first, is 8 hours enough time to cook completely as I know most slow cooker meals call for eight hours for thawed meat. Thanks for the idea! Yes. Always check the meat to make sure it is finished cooking. If it is not done cooking then cook longer. All of the cook times I listed are approximate, each slow cooker is different, so when you make a recipe for the first time watch to make sure you don’t under or over cook it. And congrats on the new baby! I bring it to your attention only because I see she’s got one of your pictures (the bags on the counter) along the right side bar with no mention of you and it’s not linked to your site (perhaps it’s just broken?) But anyway, I thought you might like to know. Thank you! I will try to get ahold of her and ask to take it down, thanks for your help! Just bought a slow cooker and dying to get started! My question, can I dump the FROZEN ingredients straight into the crockpot? Or do I need to thaw them out before I start? And I just LOVE this site (found via Pinterest)!! Yes! Depending on the size of your slow cooker, you may need to let it thaw for a few minutes so that you are able to break the “brick” up into a couple of pieces to get the lid on. Does that make sense? Wow! This is a great idea! I can so do this! Hi There! Cant wait to try your recipes with my new slow cooker!!! My machine says do not use frozen food in the cooker, is it safe to bang the meals straight into the pot? will the meat be safe from bacteria growing? Thanks so much!!!! That is what I do! The temperatures get high enough to kill any bacteria so you should be fine, unless you left the meat out for a long time before you froze it. Hi! I’m SUPER interested in your Ecookbook. I don’t have a kindle or anything like that – so is it a .pdf file? Can I just download it on my computer and read it? Thank you, thank you, thank you!! I’m always looking for easy ideas for my family. I have 3 small children…family of 5, and I do most meals at home. 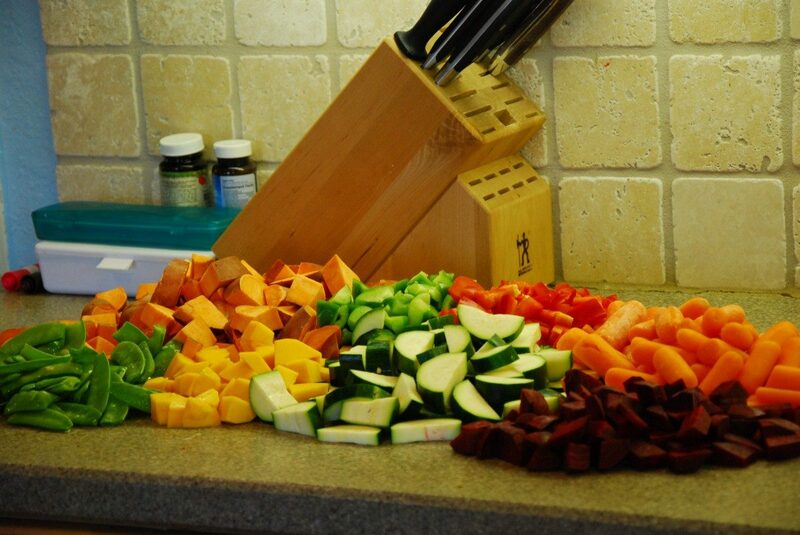 Some how , I always feel like I’m in the kitchen….cooking all day. This will make my life SO MUCH EASIER. You are a genius. I dont like zucchini so is it possible to add carrots and mushroom instead?? Sure you could use any veggies you want! i dont like sweet potatoes as well is it possible to add white potatoes\???? Yes, but white potatoes turn a bit brown/black from freezing. It does not affect their taste in the slow cooker, but they will not look perfect. Am I right in only seeing 3 recipes or are there more for this post? On the raw meat & veggies question: raw meat coming in contact with veggies is only an issue if those veggies will not subsequently be cooked, or will not be cooked enough. For these meals there is no issue since everything will be cooked together. Look at it this way- if you were cooking immediately they would all be together anyway. Definitely going to be making these meals! So I am not a mother but I will soon be a wife (at 20!). My (soon-to-be) husband and I will both be military officers working on our Masters degrees. Currently I’m still in undergrad and have so little time and money to cook healthy meals. This was a godsend. I can even use this when my (soon-to-be) husband and I move in together with our busy schedules. I appreciate you blogging this and so many other useful tips and tricks to make life easier. This is evidence enough that your blog is applicable to the busy lives of many women, and it’s especially helpful to me since I will be going through pregnancy and motherhood down the line and have know idea what I’m doing 🙂 Thank you again! So glad I found this blog!! I have a 9 month old and I am expecting #2 in a couple of months. Bed rest starts soon and this idea is going to make it so much easier on my husband while I’m on bed rest and after the baby is here. Thanks for sharing!! On the healthy bbq, could i thaw it and then bake it to avoid it being so mushy?? Thoughts? That is a good idea! Try it and let me know!! I copied your BBQ Chicken recipe into MSWord, I save as the website and usually write the blog name on the page with the pin. e.g. save as: mamaandbabylove, I think I will have to update the method to a discription of what is in the files. I will be doing much looking for this recipe. LOL. If you check out my website, don’t laugh too hard. I am really the newbie at this. Question, on the goulash it calls for 4 cans of 6 oz tomato paste. Is this the correct amount or was that a typo? It seems like a lot! is that tomato puree ( concentrated)? I’m not sure if this question has come up before, but when you cook the meal, do you add *both* gallon bags to the crockpot? Or is one bag equal to one crockpot batch? Thanks! I am not sure if this was asked before, but was wondering what size crockpot you have. I ask because when my 7.5 quart broke my husband bought me a 6 quart and it seems very small to me… I want to make sure all this will fit before I make bag upon bag of food. Thank you. I have a 6 qt. You should be good to go! Part of the reason I came up with these recipes was for a way to coat the veggies with a yummy sauce to make my husband eat them. I say cook the veggies and serve yourself and your family and make sure you are healthy and getting nutrients and then if wants to pick them off fine. But don’t not make vegetables for your family because of him! I love the idea of doing this but I have a hard time with veggies that are too long in the crock pot. I think that I would separate veggies from any meat that was going in. I love the meat when it’s been cooked for so long but no matter what the recipe I always wait to put the veggies in because I like them to still have a bit of a crunch (unless it’s something like chili). My question is do you really make all your meals for a whole month at once? Every dinner for a whole month? That seems like a daunting task and where do you store it all? Do you have a second freezer? I just think about how small my freezer is and even doing dinners for just me and my husband for a month would never fit. I love my veggies soft, but I always do serve it with something to give me some crunch like a salad or couscous. But you could leave out veggies and add them in the last thirty minutes to sauté them separately and then just mix them in when everything was cooked. I do not usually do a whole month anymore. I usually do three recipes and get 6 bags and that lasts about two weeks with leftovers and eating out sometimes. I do have an extra deep freezer. I highly recommend getting one! I just wanted to point out these are GREAT for babies who are starting to eat table food. Everything is nice and soft for those with few teeth and SO HEALTHY! It’s a great way to include them in the family meal. Which is great because I know my little one wants anything and everything he sees go into my mouth! wow!! can’t wait to try mass-freezer-meal planning 🙂 i am a mom to 5, so we eat a lot of home cooked meals. my question is, do you reuse your freezer bags? if so, have you found a good way to wash and dry them? if someone else already asked that, i’m sorry. thank you in advance! do you reuse your freezer bags? if so, have you found a good method to wash and dry them? thank you!! I don’t, but you probably could get away with it once, if you washed it with really hot water. But that kind of plastic breaks down really quickly and when heat is involved that is when the chemicals leach out. When you are only freezing them its nothing to worry about, but as soon as heat gets involved it is something to worry about. So, you can do freezer meals by mixing raw veggies with uncooked meat? I tried all three recipes this last week. Yay! They were great and my family enjoyed the results. I had a great couple of hours with my oldest son (he’s 14) chopping veggies and putting the bags together. So, good family time and good meals. I will definitely explore more of the recipes. Thank you. Stephanie, I actually have a question… I prepared two of your Freezer Cooking with Slow Cooker Recipes in advance of the imminent birth of my daughter’s second child… so she wouldn’t have to plan and cook meals when she came home. I inadvertently put the sweet potatoes from the Healthy Mama BBQ Chicken in with the Stephanie’s Goulash bags! Given the fact that the directions for the recipes say that, on the day of cooking to dump the contents of the bag into the slow cooker, this presumes frozen, right? So, if she defrosts the bag completely in order to remove the sweet potato, will that change the cooking times? I’d really appreciate your input on this as soon as possible, please? P.S., I cooked my bag of Healthy Mama BBQ Chicken the other day and it was DELISH! I’m having some of the leftovers today for lunch. Yum. lol. I would just make a note on the bag, that you forgot to add it and then add it the day of cooking. I do that all the time! I am looking for recipes that I can make, take to my sons to freeze and cook later in the crockpot while at work or school. Please post more or tell me where I can find more of them! I have an eCookbook with more recipes too! This is great! I looove my slow cooker and have been wishing for a way to once a month freezer cook and slow cook. Can’t wait to try your recipes! Love that you use so many veggies! I want to try these too but do you cook the meat prior to freezing or just add the cut up raw meet in with the veggies? nope, you assemble it raw. never mind, I just found someone who asked the same question and I guess it is a yes, you can add the raw meet with the veggies.. going to do all of my cutting this weekend. During the week I don’t get home from work until around 5:30 so usually make something simple for dinner, these are great ideas for something a little bit fancier without having to eat out. Thank you..
Was wondering how well do fresh leafy greens do in freezer slow cook recipes? I always have a ton of different green from the garden (kale, swiss chard, different lettuces etc) and would love to freeze them to do these recipes. Do you think they will do well? What about fresh herbs instead of dried ones? My basil is going nuts in the garden! Love this site! I will be making Healthy Mama BBQ Chicken this weekend and had a question – we prefer boneless/skinless meats – do you foresee any issue with using boneless instead of bones? Also, should I adjust the amount of meat in the recipe? Thanks! I don’t have kids but I do have both of my elderly parents with Alzheimer’s and dementia living with my husband and I. This will be a huge time saver. Thank you! Tried the healthy BBQ chicken last night. Did not taste at all like BBQ, but was delicious anyway. things were a little soupy so I made rice and dumped it over that. Super good. Freezer cooking makes me look like a genius in the kitchen. got any cheater methods for desserts or breakfast? I like to cut time in my kitchen. I work a lot and just want to crash when I get home every night. Question on the goulash – is it 4 total 6 ounce cans of tomato paste or one 4 to 6 oz can? Hi. My crockpot instruction manual says not to put frozen food into it without putting water in first to act as a cushion to prevent cracking the pot. Do you do this before adding the bags of frozen food? Also, I have a large crock pot, could I put both bags in for a meal? The dish came out very watery, MY FIX: I used a slotted spoon, took all the veggies out, took out the chicken and shredded it and discarded most of the extra sauce that it made. (I took out 2 cups of liquid). Then I put everything back in the crock pot (shredded chicken and veggies) and cooked for an additional 30 minutes. This recipe was good, but not great and in my opinion did not taste like BBQ chicken. I did love how healthy it tasted and the flavors were still very good and my husband liked it, but I think taking out the extra liquid was what saved it for us. Hi Lali, I’m sorry the recipe did not meet your standards, but you have to understand that you made many fundamental changes to the recipe and then stated it did not taste like BBQ. The recipe calls for bone-in dark meat which produces way less juice than breasts (especially if you buy conventional breasts which are usually plumped with saltwater) and then you added strong ingredients that are going to take away from the standard BBQ taste, mustard and garlic especially. Obviously you can make all the changes you want to any recipe, but once you do, that recipe is now your recipe, so you should be critiquing your own work, not Stephanie’s work. Actually, I’m inclined to agree with Lali. The ingredients are (on the very base) similar to a BBQ sauce but it is NOT a BBQ sauce. The sauce is much, much more close to Sloppy Joe sauce than anything else. If she added equal amounts of “extra” of the other ingredients, it would all balance out. Either way, I don’t think it should be called “BBQ Chicken” but more of a “Chicken Sloppy Joe” mixture. Hi! Made and froze the BBQ chicken to help our family adjust to my being back to work as a teacher. I read many of the comments and saw many differing opinions on the frozen/raw chicken issue. So, Stephanie, my question is what do you do now? Put the ingredients into the slow cooker frozen that morning or take out the night before? I trust your method works, thank you for these recipes that help simplify our crazy life! I have a question concerning the e-cookbook, rather, the labels. What brand and size do you recommend printing them on? I looked for the information in your book – and quite possibly missed it – but I couldn’t find the information. I purchased it today and I appreciate all the details that you include in the recipes! I am looking forward to a much easier life when it comes to preparing meals for my family. Thank you for taking the time to share your wisdom with others. So, I gave this a try. First night of cooking the meals……I must say it was wonderful not have to put thought into what was for dinner, however the goulash recipe did not go over very well in my house. I followed the recipe, but everyone said it had no flavor. So, we will give another one a shot tomorrow. Since you are dividing everything into 2, one gallon freezer bags, does that mean each bag is one meal? and you only cook one of the gallon bags? and One of the gallon bags will feed 2 adults and one toddler? Do I have this all correct? Thanks! What a brilliant idea! I love using my slow cooker but usually cook with it at the weekends as I have more time to prepare then than through the week when I have to rush out to work. I never thought of freezing BEFORE cooking though – this is a lifesaver as I can pop everything in before I leave for work and come home to a hot delicious meal. I just bought your Ecookbook today! I can’t wait to get started!! I have been trying to loose weight and become healthier for a very long time! After putting on an embarrassing amount of weight from my poor eating habits, I decided I need to become healthier for myself before trying for my first baby. I am so happy I found your site and cannot wait to see what this could possibly do for my health. Also, do you recommend any sites for more Real Food recipes? I’m very, VERY new to this and excited to start my new healthy life. Yay! So excited for you! Your life is about to CHANGE! Check out the Real Food tab at the top of the menu bar for lots more recipes from me. Then also look up Real Food Media and see the listing of all the Real Food bloggers out there. Hi Jenny, if the recipe doesn’t call for stock, it doesn’t need it. If it is frozen first, the water that melts from it being frozen mixed with any sauces or other liquids is enough. I always recommend to watch your slow cooker the first time you make a meal, because just like every oven is different and cooks different, so are slow cookers. If you feel like it needs more liquid or just simply want more sauce, then add 1/2 cup of stock or water at a time until it get to the desired consistency. Hi, I tried it without the stcok and as I suspected it was only fit for the bit and all dried up! 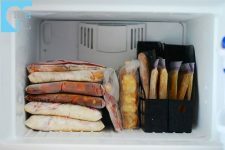 If food is frozen properly in containers or freezer bags the pieces of food won’t gain moisture. Anyone reading this, you MUST add at least 1/2 pint of stock!!!! Mine have never dried up on me, but yes, like mentioned in other comment responses, if you think your slow cooker cooks hotter than others, or want more liquid or just want to add stock because you want to, I always recommended adding a 1/2 cup at a time, till you get the consistency you are looking for. Hi Stephanie – I was hoping for a bit of advice – I have tested 3 different slow cookers now hoping to find one that will actually cook something on low for 8 hours – to date – no luck! Which one do you use? Also, I tested out your Chicken Curry recipe – and while the flavor was great – the sauce was minimal – thoughts whether it would be better to add another thing of cream of chicken or chicken broth? I work a full day so I am really hoping I can figure out how to utilize the slow cooker! Any suggestions would be great! Am I right in assuming that each recipe makes 2 batches? I am making this for our freezer club exchange and wanted to make sure I am reading it right! Thanks so much! Yup, each recipe makes two bags/meals. I read in the comments that the veggies turn out mushy and your family prefers them that way. If I were to make each meal into two bags(one for meat, one for veggies) when would you suggest I add the veggies to have them cooked, but with some texture to them? Great idea!! I would add them the last hour, if you don’t want them as soft. I would probably add a little bit more liquid with the meat so it doesn’t dry out and over cook, the veggies protect the meat during cooking. Hi! Thanks so much for sharing this recipe. I tried out the BBQ chicken and it’s become a house staple for us! I shared it on my blog as what I made for my twins dinner: http://www.mommyhoot.com/?p=1462. I am totally going to try out some of your other recipes as I’m sure they are going to become house favorites too! Thanks again and I just love looking through your blog! Looks like you just have a total blast. I bought your ecookbook and am trying it out. We’re doing Cherry Chicken today. I had a question about the Opa’s empanadas though. It just says ‘beef.’ What kind of ‘beef’ am I looking for? Hi Stephanie, I paid for your cookbook, and it was charged to my credit card back on 10/21/12. I have not received this yet. Can you please help? Sorry about that! It must have gone to your spam folder. Please email me at [email protected] and forward me your payment confirmation email if you can, and I will get a copy to you ASAP. What kind of curry do you use? Red, yellow, etc. Like what brand and such? I bought your cookbook and I love it! Yours is a breath of fresh air in that it uses real foods and few additives. I have a mini slowcooker and I live alone, so I just half all the recipes and put them in medium sized freezer bags. I’m gluten free and corn free and am a super busy young professional, so I was so glad to find a cookbook so suited to my allergies, desire for a healthy lifestyle and busy schedule. Thank you and keep it up, I’m telling all my friends! That is awesome to hear!! I have more and more people telling me they do just what you do, half the recipes and use a mini slow cooker! I just wanted to let you know that I got some of your recipes off of pinterest . I haven’t been able to sample all of your recipes for making freezer meals but I can tell you I LOVE IT!! It makes it so much easier for myself and my husband, especially since I work shift work and very seldom find time to make supper. I am actually hoping to be able to purchase your cookbook to get even more meals into our freezer. Lol, I want another one too! So I can chicken stock going all the time, and have a free one for my dinner meals! I have repinned your link from Pinterest and am looking forward to trying a few recipes. One request I have is that your ebook be available in Germany so I can download it. Not sure what that would entail, but I hope it will bw available soon. Just was laid off from my job and looking for easy inexpensive recipes and this sounds perfect! Can’t wait to try them all! May have to change up a few of the ingredients though since my 16 year old has to eat gluten free. Hey Lori. So sorry to hear that, but on the bright side, you won’t have to change any recipes because they are all gluten free! One thing I haven’t seen in comments is, for some of the veggies such as red and green peppers, can you purchase the ones in the freezer section to throw into your bag vs fresh? This time of year, sometimes it is difficult to get a decent bell pepper without paying an arm and leg for it. Thanks in advance for your reply, I’m really looking forward to trying your recipes. So am I missing something or do you eat the same three recipes everyday for a month? LOL, no I roate them. If I were to eat only slow coooker meals all week long (which I don’t) this would be about two to three weeks worth of food. But I do this once a month and have a slow cooker meal once or twice a week and eat leftovers and then do simple, fresh dinners the rest of the time or eat out. Doing this once a month, even if I still have bags in the freezer, means there is always a good variation in the freezer to pull from. I just found your site last week. I compiled several meals from your site and several from some other sites. On Sunday my husband and I created 18 meals to freeze. It was a lot of work (6 hours) but it worked out great. I have an electric pressure cooker and plan on making most of the meals in that. What I love about the pressure cooker is that it only takes minutes compared to hours in the pressure cooker. Tonight I made sweat and sour beef with vegetables (used sirloin tip) in the pressure cooker and it only took 10 minutes (not frozen). The meat was very tender and the vegetables were not mushy. I’ve been cooking in a pressure cooker for three years and absolutely love it. Everything I used to cook in the crock pot is now cooked in the pressure cooker . I was wondering if I can transfer my ebook (Freezer Cooking) from my iPad to my PC? I can’t print out the recipes I need? I live on an island so all our meat comes to us frozen (unfortunately no meat is raised locally). Do you ever put whole chicken parts (thighs, etc) into the freezer bags? Otherwise I’d be thawing the chicken just to cut the meat and then refreezing it, which to my knowledge is unsafe. Yes, I have put whole chicken parts, all of my recipes can be done with bone in pieces (which makes the broth/stew even more nutritious). I also refreeze chicken sometimes after cutting it up into pieces, as long as you are not leaving the meat on the counter all day and then refreezing it, it should be fine. Hi! Just saw your method featured on LearnVest. I was wondering about the freezing…I’ve been taught to blanch most veggies before freezing so they don’t turn soggy when thawed? But the ones in these recipes are OK to freeze as is? Also, can we just leave in fridge the first 2-3 meals after prepping for 2-3 days? Hi! 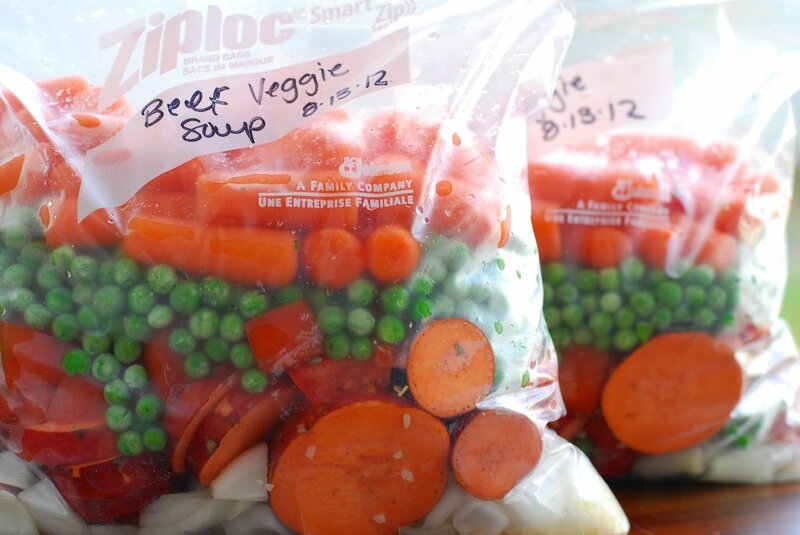 Can I freeze veggies AND meat in the same ziplock bag? or is it better to seperate them, they’re all going in the same pot uncooked anyway right? I made Stephanie’s Goulash last week and started it in the crockpot really late! Thankfully I defrosted my meat partially before I threw it in there, but added the rest of the stuff straight from the freezer. On high it cooked perfectly in about 6 hours and was DELICIOUS! I try to eat Paleo, so I omitted the noodles and ate it like a stew. It was so rich tasting. Everyone from my skeptical husband to my picky 4 yr old loved it. Thank you! That’s wonderful to hear! thanks so much for sharing!! The recipe is doubled, it’s a lot of food. You could do half the amount of food and put it in one bag, but part of what makes this effecient is chopping similar things at once and making lots of meals quickly. Question, I used to do Dream Dinners also but they were very expensive. I am looking forward to this, but my question is do you really add the meat in with the veggies, sauce and everything to freeze? I think with Dream Dinners they separated meats and sauces… been a long time. Thx. What are Dream Dinners?! Yes, it is totally fine to put the meat in with the veggies. I go in greater detail in my cookbook, but it is totally fine. But if it really makes you squemish or you buy your meat in bulk you can leave it out of the bag and just do veggies and spices. Hello I just wanted to ask about the healthy BBQ chicken. Is the chicken boiled prior to putting in bags or does the drumsticks just cook with the vegetables? Don’t want my chicken to dry out. Thanks in advance! They just cook with the veggies and other spices and ingredients. Do you know if anyone has ever figured out the WW points for your meals in your freezer cookbook. They don’t list the carbs and before I do the work to put them into a WW recipe builder, I’m wondering if someone has already done it. I just bought the book and can’t wait to start cooking/freezing! No, I never did calculate the WW points for the recipes. There are sites you can dump the recipe into to get more information about carbs, but I am not sure. Sorry. I would say maybe find a similar protein/veggie heavy meal with no grains and see what the points are. I would guess they are about 6 points, because of having no grains. I thought most vegetables had to be blanched before freezing or they would get old tasting, what is your opinion about this? How long do these keep in the freezer? I think you don’t have to do it. It never made a difference for me in early days of my testing. If you use a ziploc freezer bag and a deep freezer they will keep up to a year. My family is very picky! I love my crock pot and I would love to make freezer meals. But he doesn’t like any veggies except peas and no one else in the house likes peas 🙁 Everyone else only likes corn and green beans. I’m kind of at a loss! Hi! I ordered the freezer slow cooker cook book about 2 1/2 weeks ago. Just wondering when it will come. I am excited to start the recipes. Thanks! The ebook or the print? Create Space is who you would contact about the print, but ebook goes out automatically and immediatly, once payment clears in Paypal. Email me at [email protected] and we will get it squared away. just wanted to say : you do know this is a way old technique right ? just about the same time freezers and canning came to be actually. Hi there, I bought your freezer cookbook and just started using it and the meals have been DELICIOUS! I have one question, though. In the book, you refer to the printable labels in the back as though they already have all the info for each recipe on them. Mine are blank. Did I get a bum copy or do I have to write in everything on the label, in which case, I’ll just write on the bag… Thanks! I’ve been trying to get in to the rhythm of slow cooker freezer meals for at least a couple of times a week – so your book sounds amazing! Question, my husband has just been told we have to switch to a high fiber diet – how would your recipes rate in this area? Who told him to switch to high fiber? And why? High fiber is not really the healthy thing a lot of mainstream type nutritionists and doctors make it out to be. He just recently was diagnosed with Diverticulitis, so the doc’s told him that’s what he needed to do in order to keep from another flare up from occurring. Read the book GAPS Diet. It will heal the digestive track. Prayers for you both. Correct me if I’m wrong.But I was under the impression that you had to blanch some vegetables before freezing? Or maybe only some particular ones? Yeah, peppers and onions never need to be blanched. If you want to take the extra step to blanch that is fine, but after doing this for years, I find that blanching or not blanching yields exactly the same results, so why do the extra step, ya know? For the Chicken Curry recipe, it says to separate everything into 2 gallon bags. Is each bag one crock pot making? Or, do you use both bags? That was SMART! So happy for you and how exciting about your kitchen renovation!